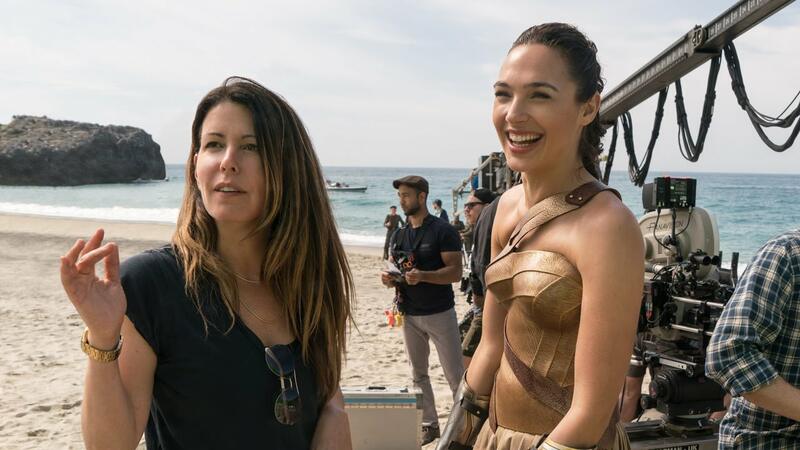 Director Patty Jenkins looks on as Gal Gadot laughs while filming Wonder Woman in 2017. 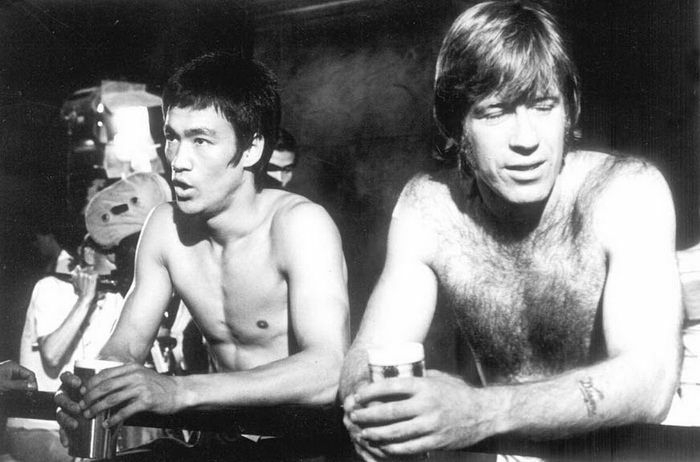 Bruce Lee and Chuck Norris take a break while filming The Way of the Dragon in 1972. 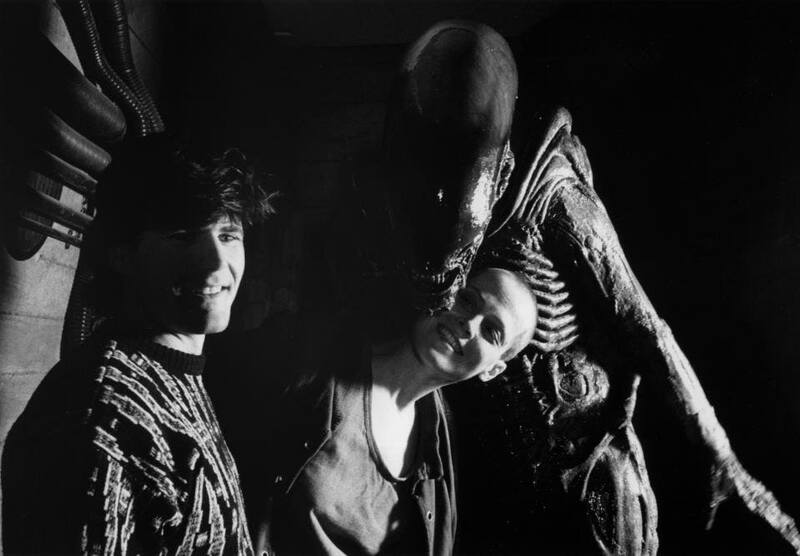 David Fincher and Sigourney Weaver pose with Tom Woodruff Jr. in the Alien suit while filming Alien 3 in 1992. 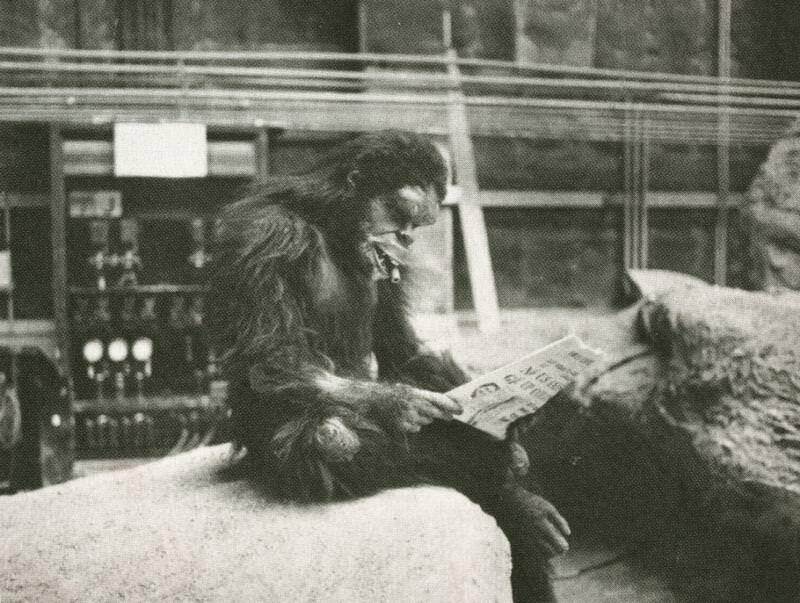 An actor in an Ape costume reads the paper between scenes of 2001: A Space Odyssey in 1968. 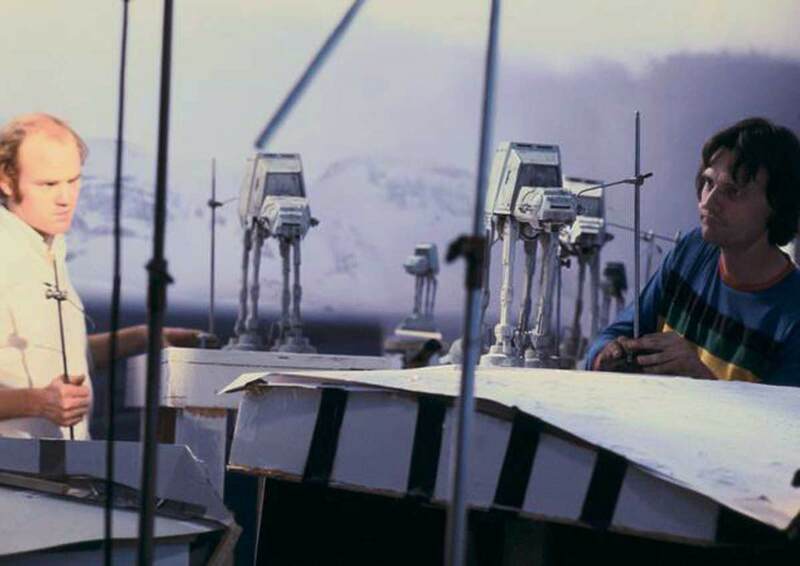 Preparing to film the Battle of Hoth scene in Star Wars V: The Empire Strikes back in 1980. 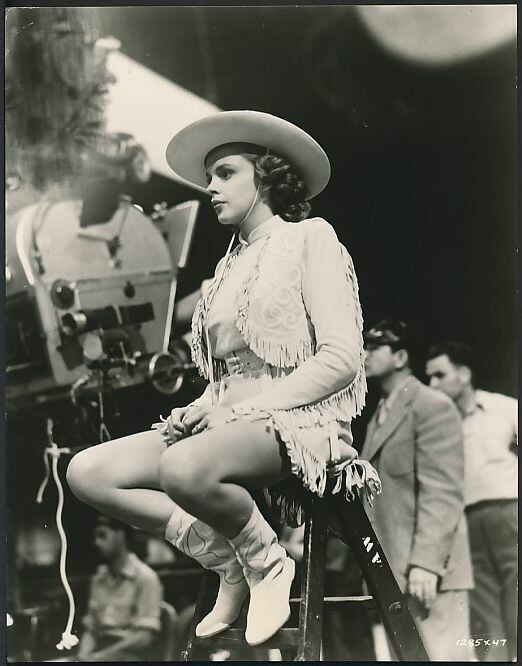 Judy Garland preparing for her scene while filming Girl Crazy in 1943. 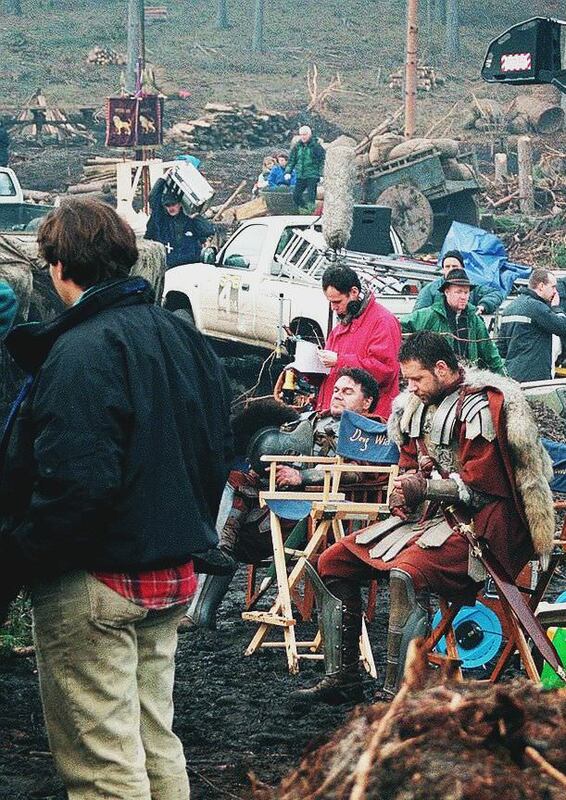 Russell Crowe preparing for a scene in the film Gladiator in 2000. 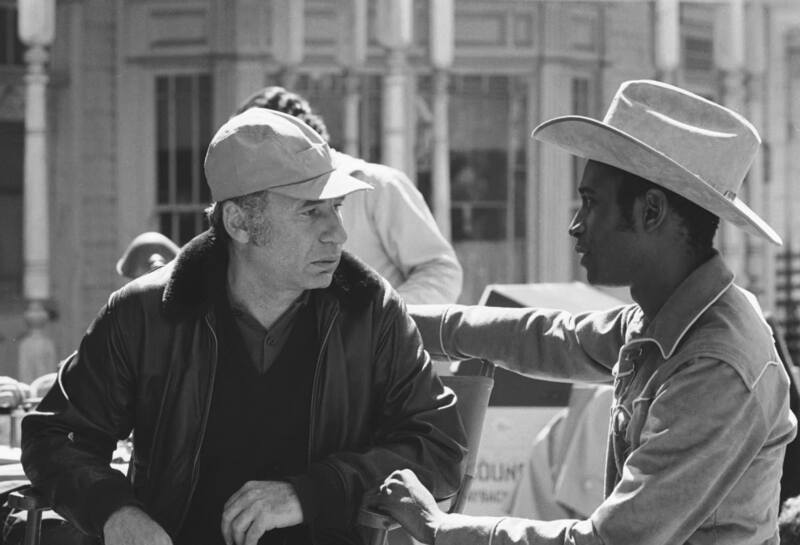 Mel Brooks and Cleavon Little discussing an upcoming scene on the set of Blazing Saddles in 1974. Steven Spielberg messes around with Jonathan Ke Quan while Kate Capshaw looks on during filming of Indiana Jones and the Temple of Doom in 1984. Jodie Foster and her stunt double and older sister for Taxi Driver in 1976. 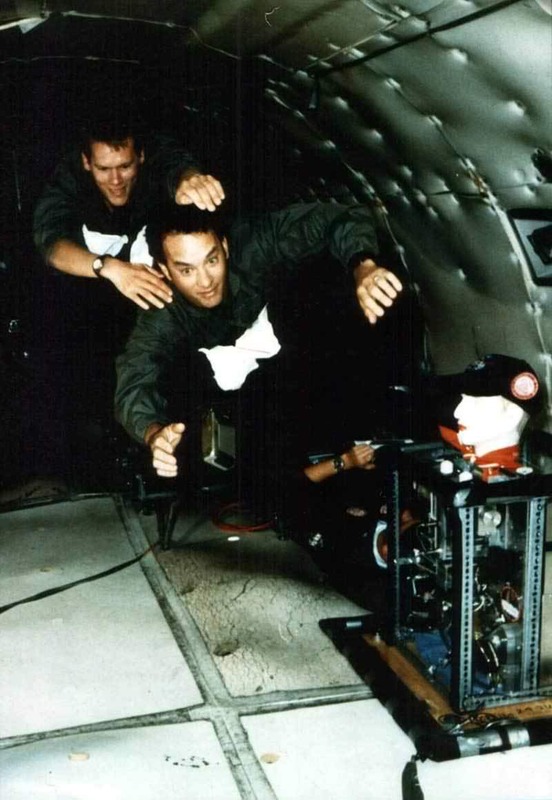 Tom Hanks and Kevin Bacon goofing off in zero gravity in preparation for their film Apollo 13 in 1995. 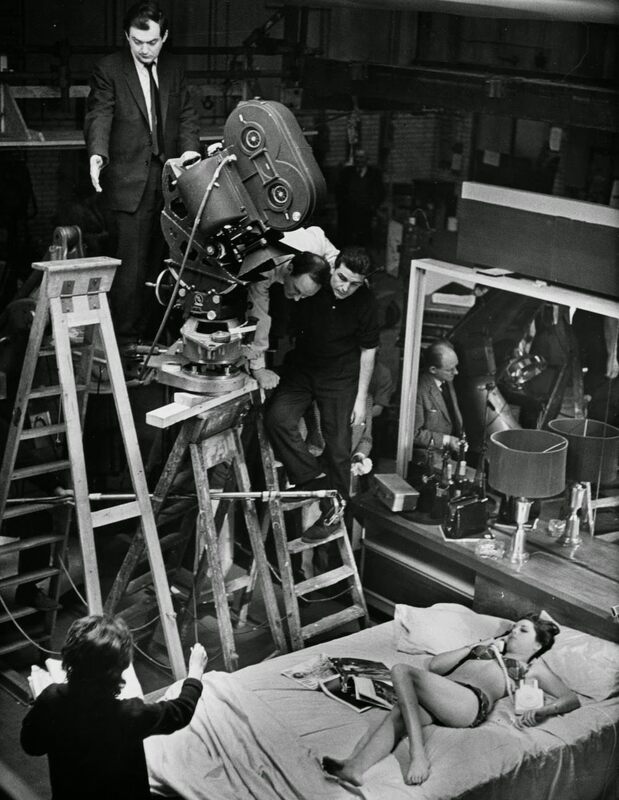 Filming a scene with Tracy Reed for the film Dr. Strangelove or: How I Learned to Stop Worrying and Love the Bomb in 1964. 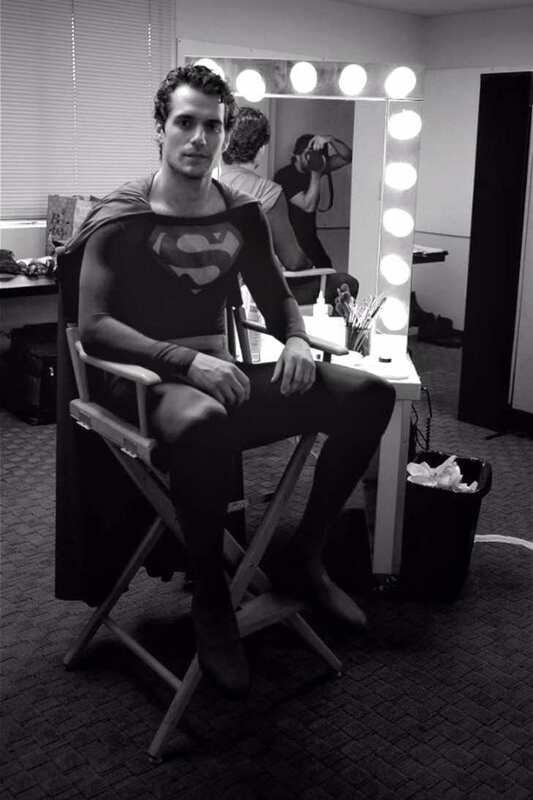 Henry Cavill, the current Superman, wears an old Christopher Reeves Superman suit before they made the new suit back when he auditioned for the role in 2011. 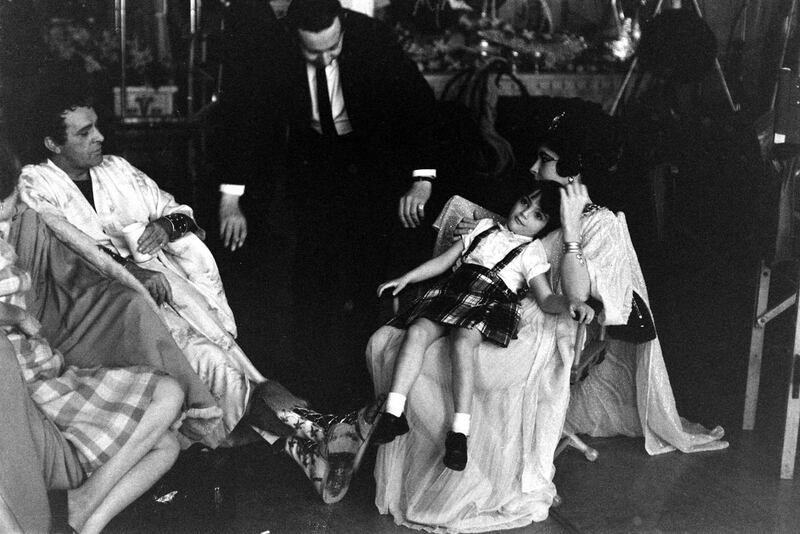 Richard Burton chats with Elizabeth Taylor while her daughter Liza Todd sits in her lap during filming of Cleopatra in 1963. 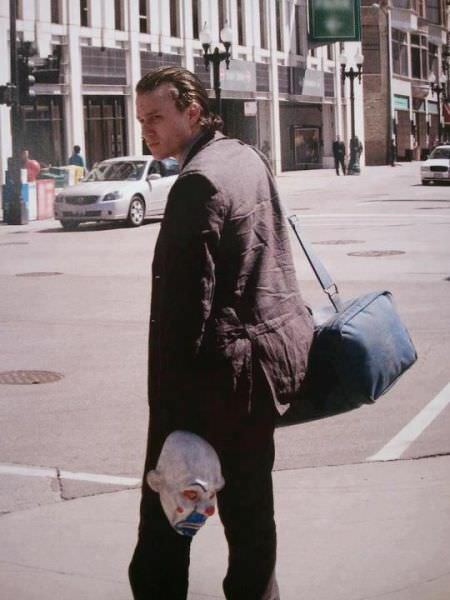 Heath Ledger without his Joker makeup about to film the opening scene in The Dark Knight in 2008. 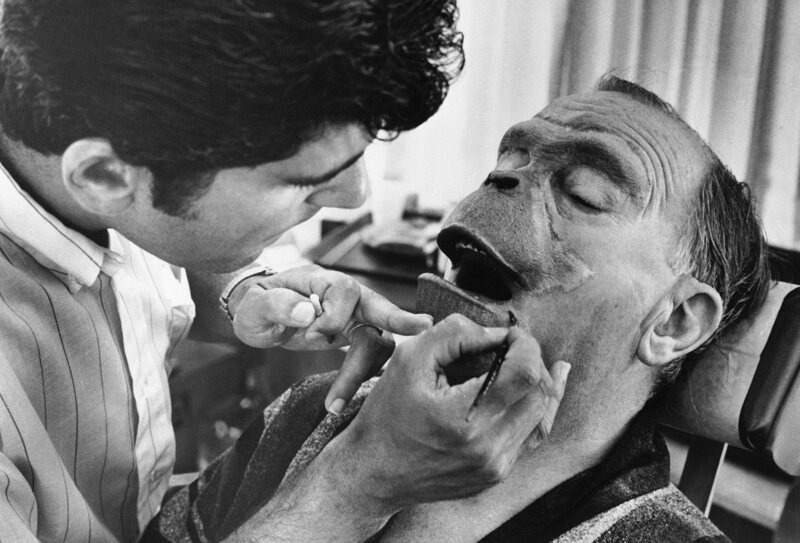 Makeup being applied to Maurice Evans for his role in Planet of the Apes in 1968. 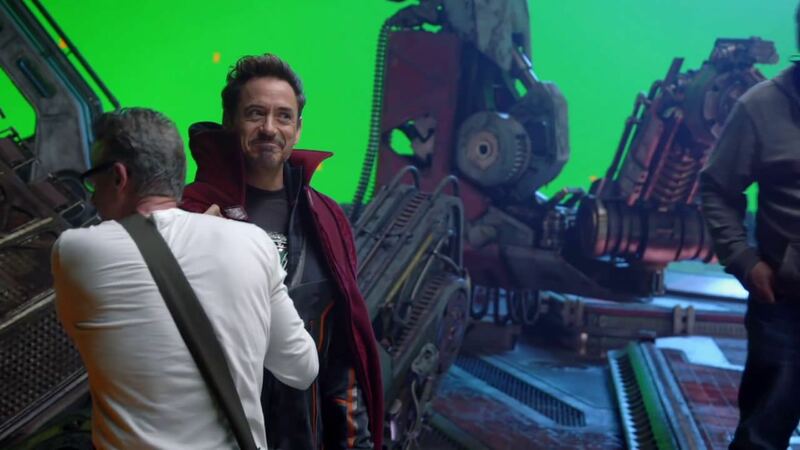 Robert Downey Jr puts on his costar Benedict Cumberbatchs coat while filming The Avengers: Infinity War in 2017. 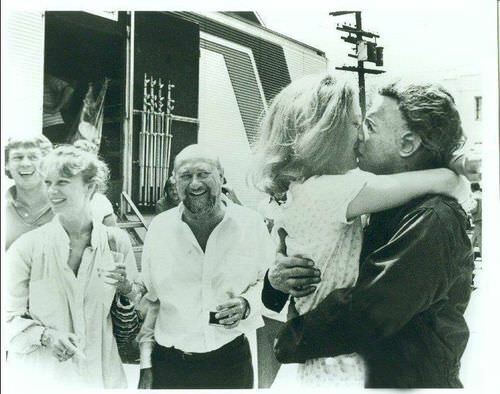 Jamie Lee Curtis kissing Tony Moran with his Michael Myers mask on during filming of Halloween in 1978. 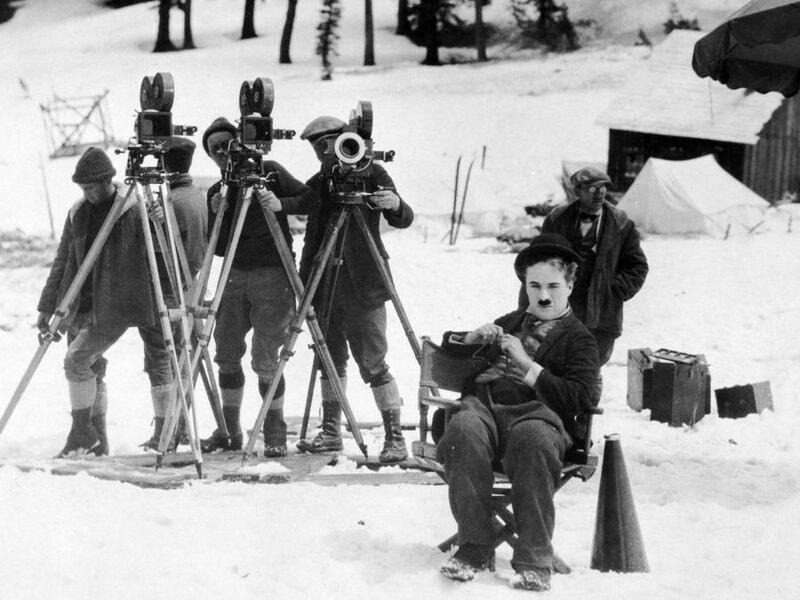 Charlie Chaplin preparing to shoot a scene for his film The Gold Rush in 1925. 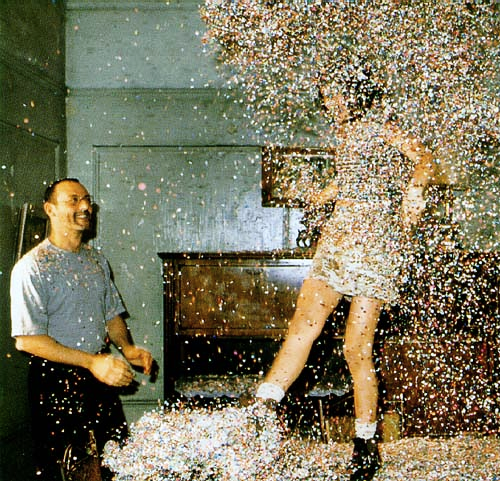 Jean Reno and Natalie Portman goof off with confetti to celebrate the end of filming Léon: The Professional in 1994. 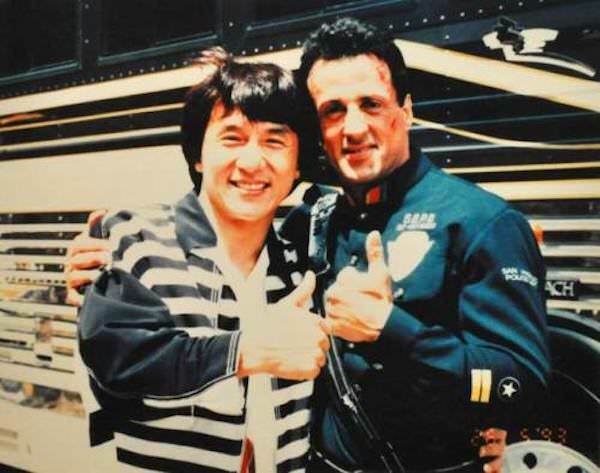 Jackie Chan takes a picture with Sylvester Stallone when Chan showed up on the set of Demolition Man in 1993. Milla Jovovich and Mathieu Kassovitz take a break while filming The Fifth Element in 1997. 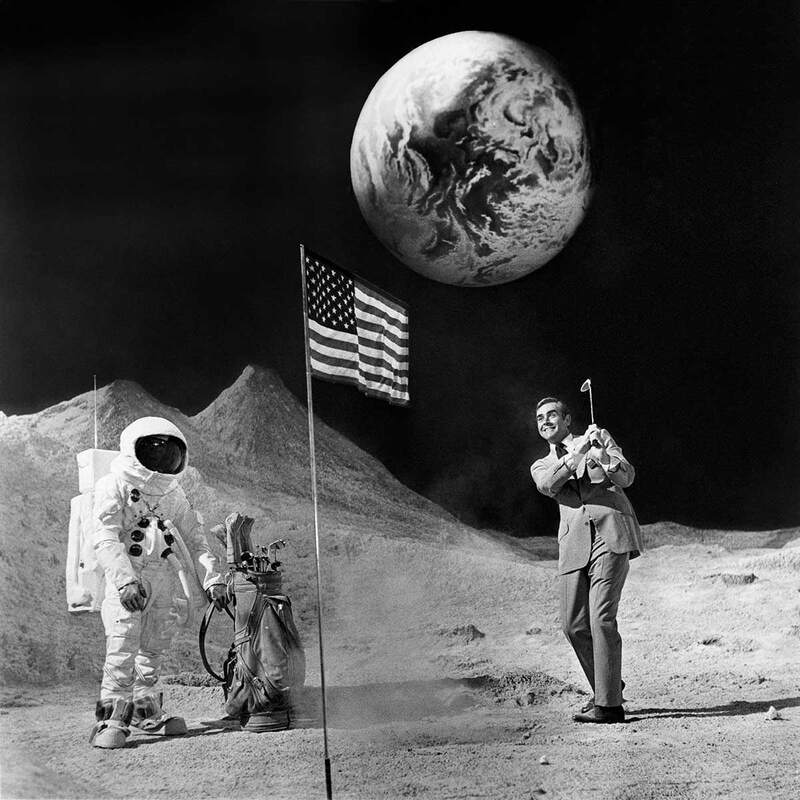 Sean Connery playing golf in between shooting the moon landing scene in Diamonds Are Forever in 1971. 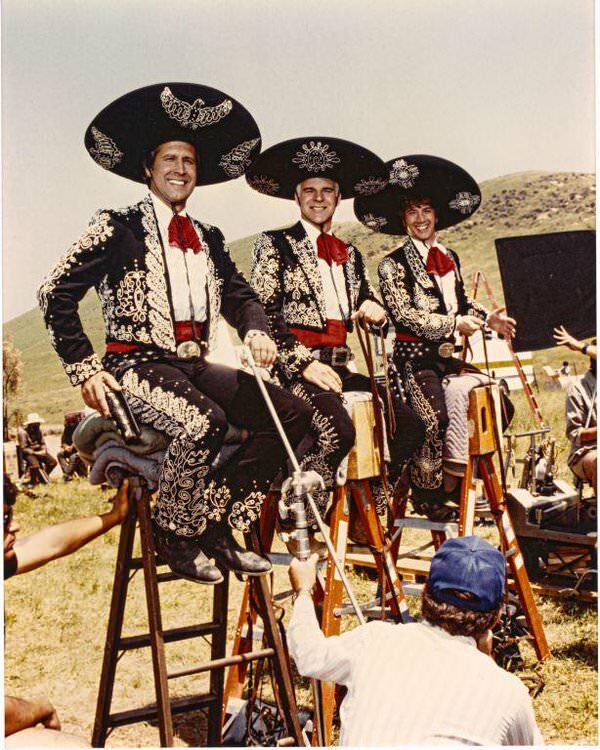 Chevy Chase, Steven Martin, and Martin Short smile prior to filming a scene in ¡Three Amigos! in 1986. 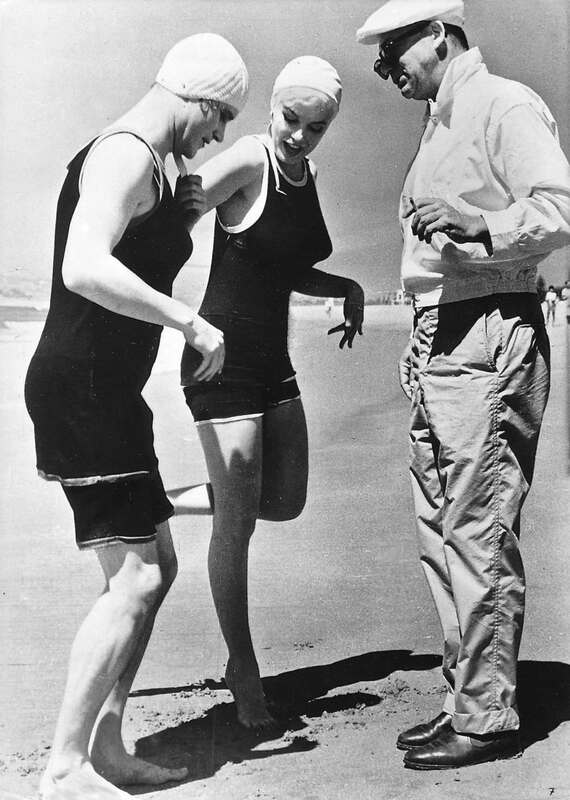 Jack Lemmon, Marilyn Monroe and director Billy Wilder prepare for a scene in Some Like It Hot in 1959. 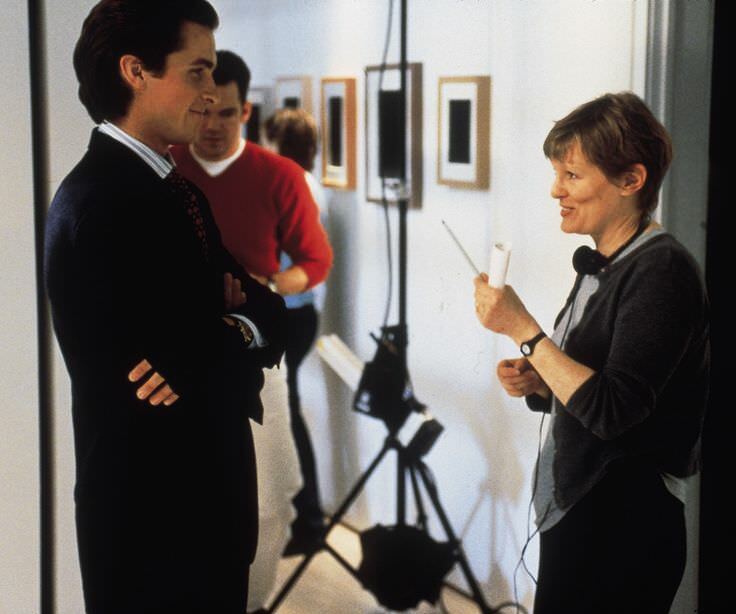 Christian Bale and director Mary Harron laugh between filming American Psycho in 2000. 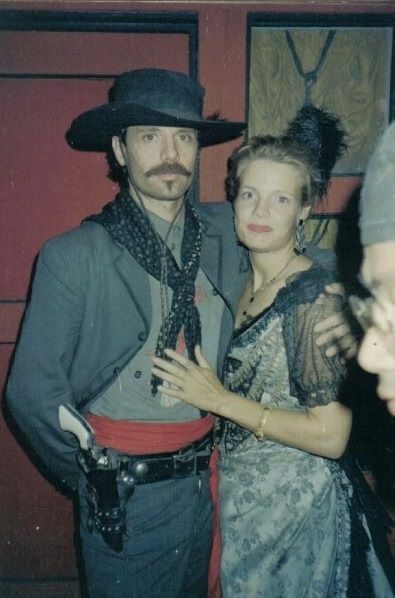 Michael Biehn takes a picture with an extra while filming Tombstone in 1994. 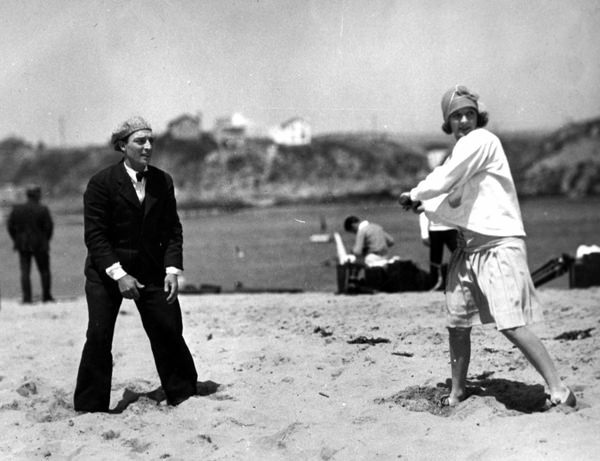 Buster Keaton and his wife Natalie Talmadge play baseball between scenes of Our Hospitality in 1923. 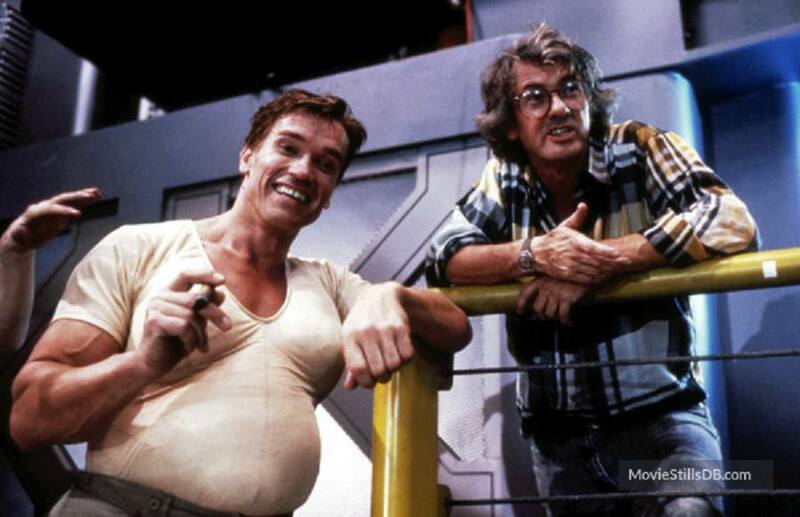 Arnold Schwarzenegger and Paul Verhoeven have a laugh while filming Total Recall in 1990. 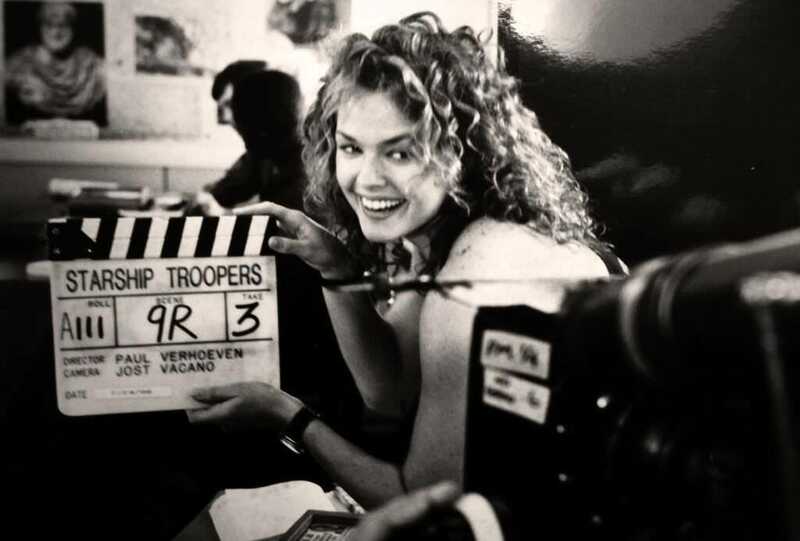 Dina Meyer messing around while filming Starship Troopers in 1997. 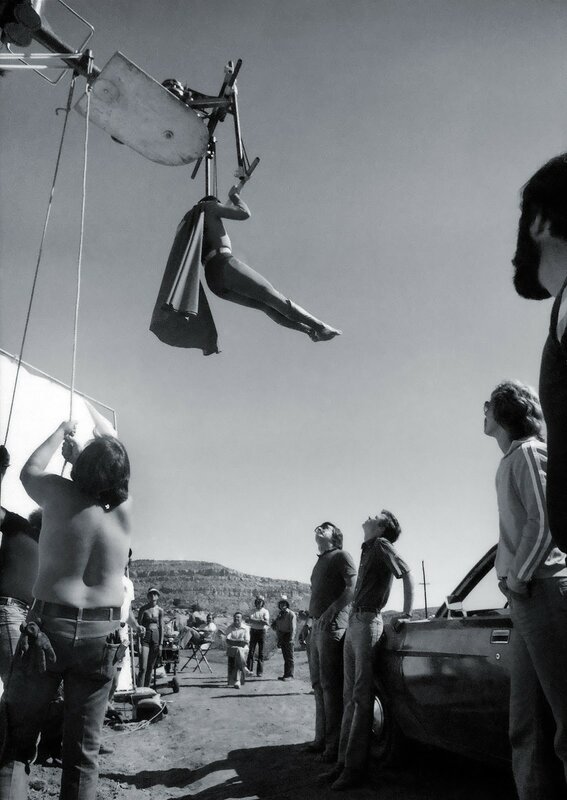 Christopher Reeves being hoisted up for a scene in Superman in 1978. 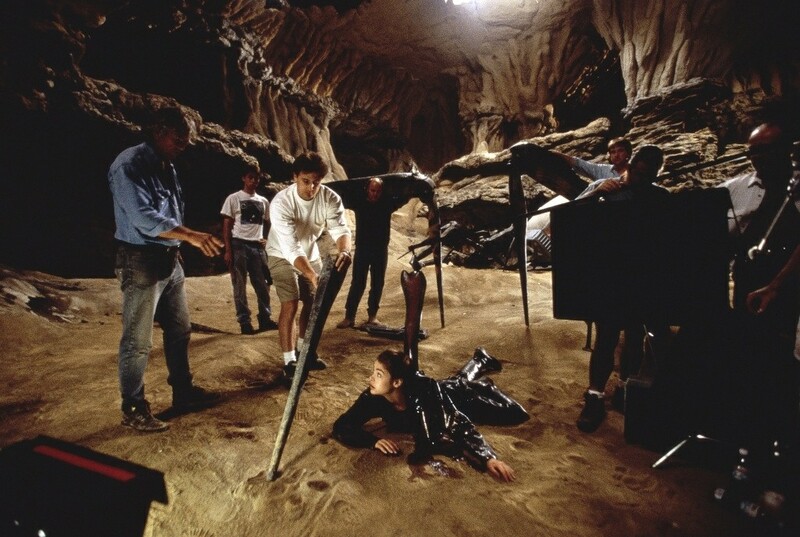 He did most of his own stunts. 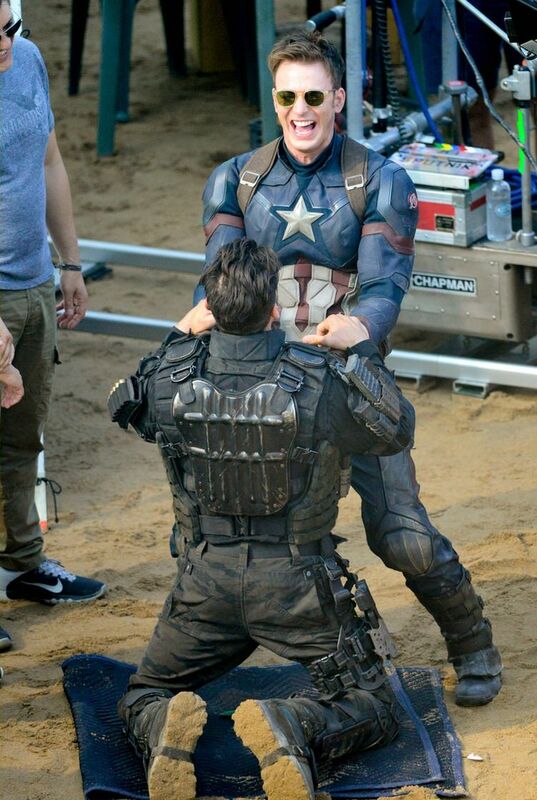 Chris Evans and Frank Grillo have a laugh while filming a scene for Captain America: Civil War in 2016. 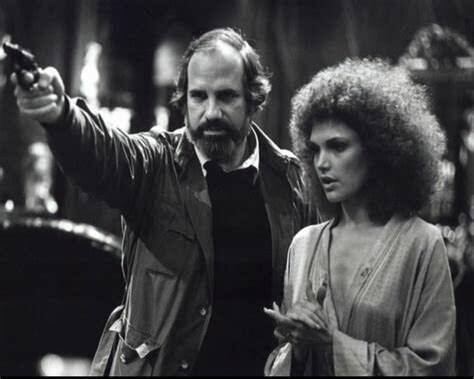 Brian De Palma prepares Mary Elizabeth Mastrantonio for a scene in Scarface in 1983. 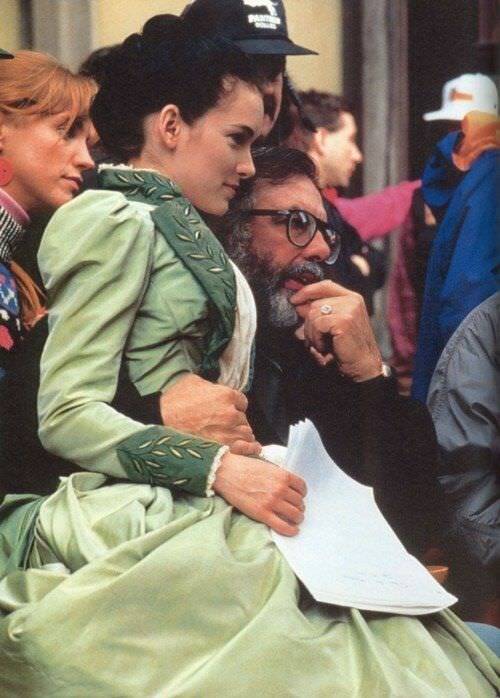 Winona Ryder and Francis Ford Coppola have a moment while filming Bram Stoker's Dracula in 1992. 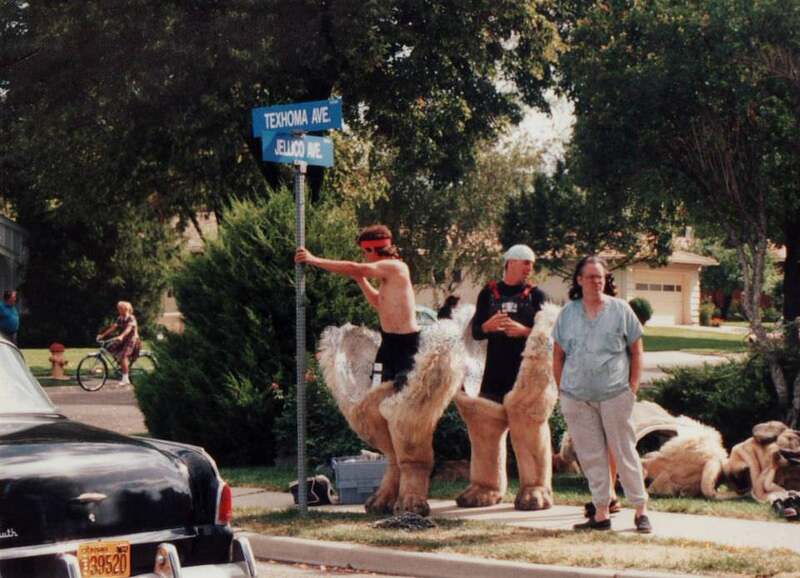 The special effects crew preparing to put on the giant dog costume for a scene in The Sandlot in 1993. 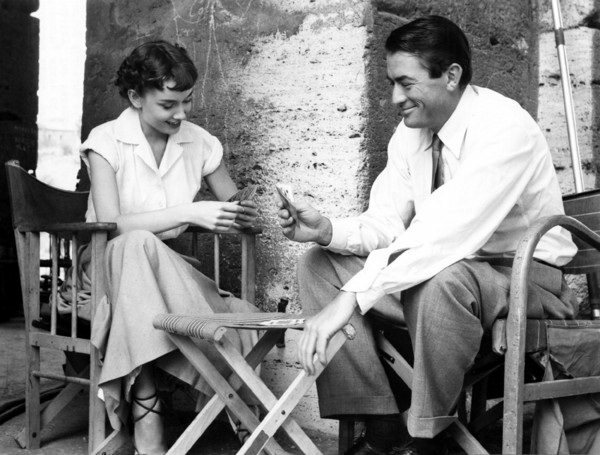 Audrey Hepburn and Gregory Peck play cards in between scenes of Roman Holiday in 1953. 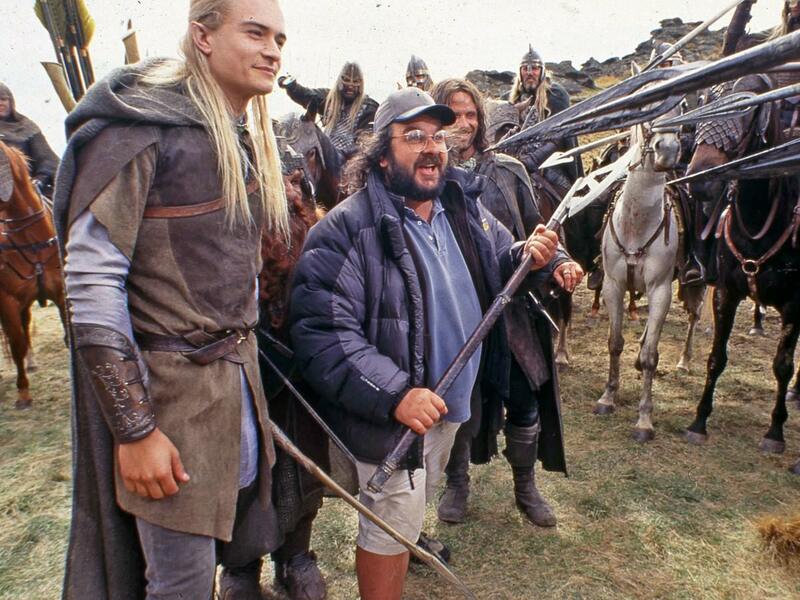 Peter Jackson shows John Rhys-Davies stand in how he wants him in a scene while Orlando Bloom and Viggo Mortensen laugh while filming The Lord of the Rings: The Two Towers in 2002. 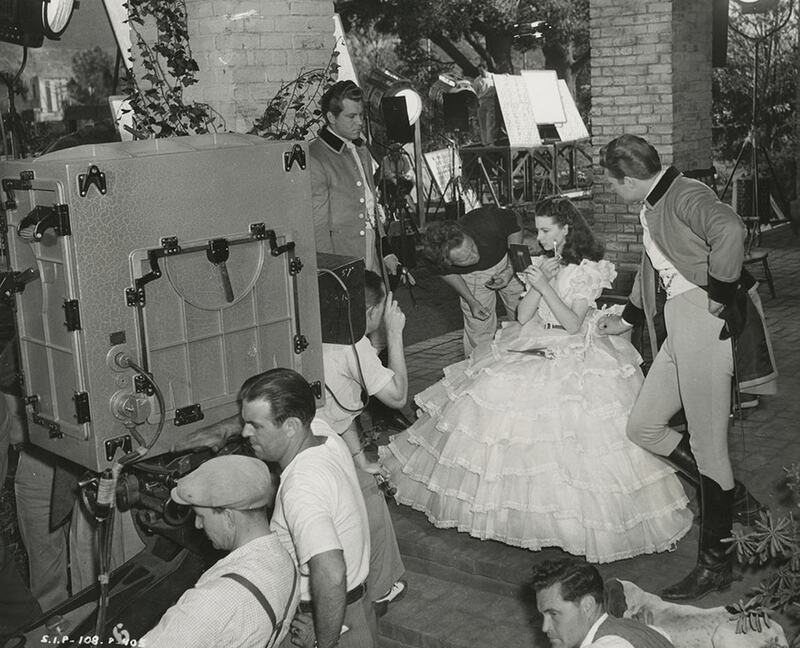 Vivien Leigh touches up her make up as Fred Crane and George Reeves prepare to film a scene of Gone With the Wind in 1939. 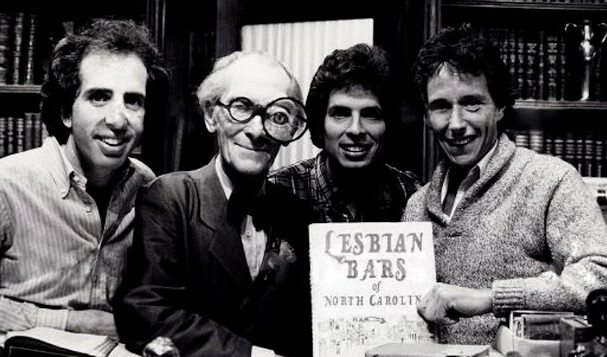 Peter Cushing (center left) with directors Jerry Zucker (left), David Zucker (center Right) and Jim Abrahams (right) while filming Top Secret in 1984. 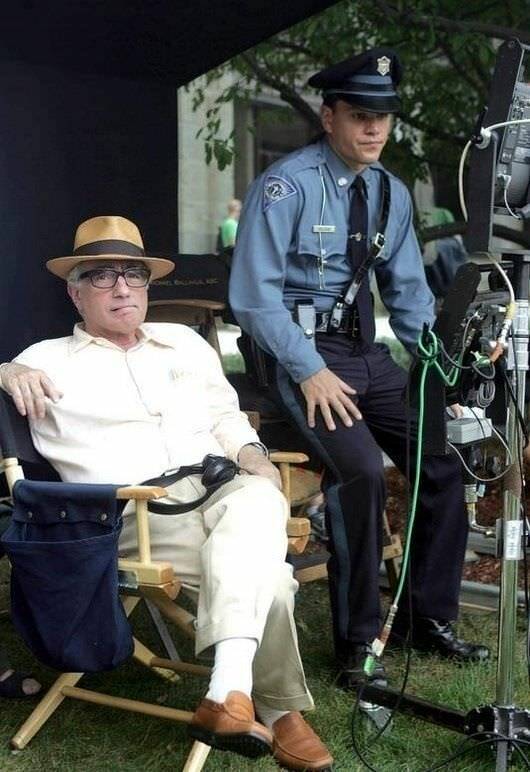 Martin Scorsese and Matt Damon take a break between filming of The Departed in 2006. 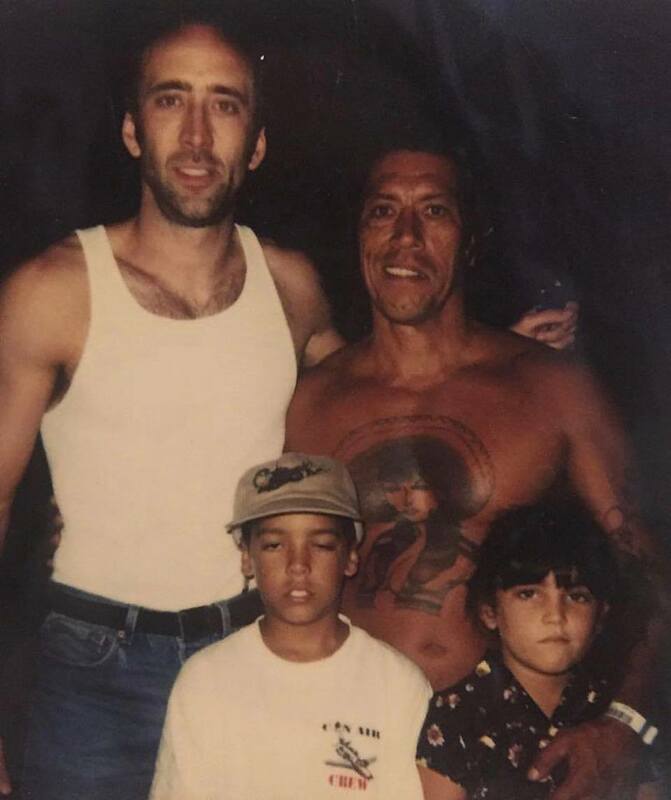 Nicolas Cage takes a picture with his costar Danny Trejo and his kids Gilbert Trejo and Danielle Trejo on the set of Con Air in 1997. 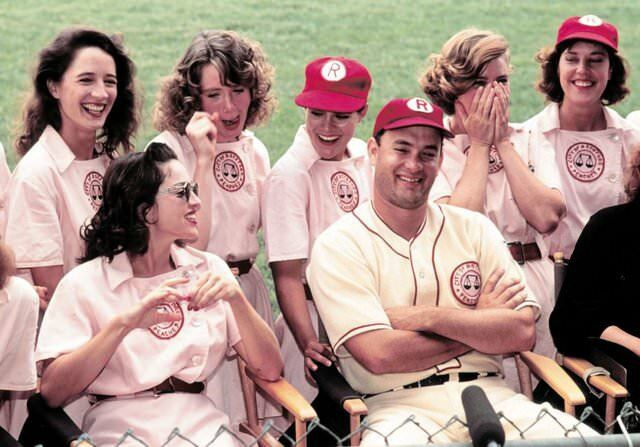 Some of the cast members of 'A League of Their Own,' including Madonna and Tom Hanks, answer questions about the film between scenes in 1991. 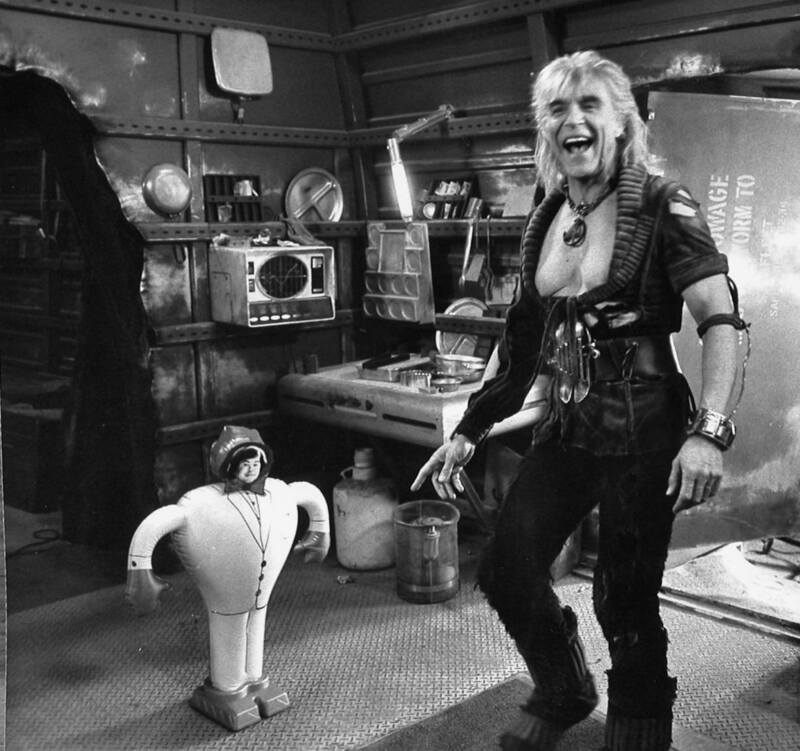 Ricardo Montalban reacting to a prank right before a scene during filming of Star Trek II: The Wrath of Khan in 1982. Paul Verhoeven telling Denise Richards what he wants prior to filming a scene in Starship Troopers in 1997. Tom Cruise and Kirsten Dunst take a picture together for a magazine while filming Interview With the Vampire: The Vampire Chronicles in 1994. Director Matthew Vaughn prepares Taron Egerton, Colin Firth, Samuel L Jackson and Sofia Boutella for a scene in Kingsman: The Secret Service in 2014. 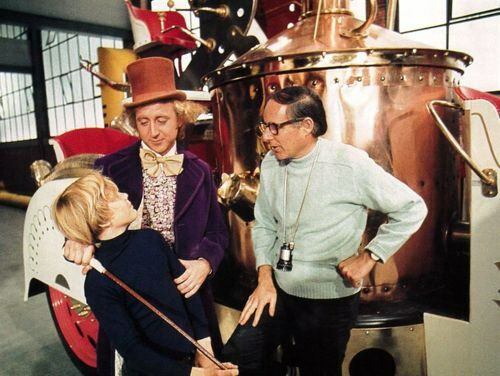 Director Mel Stuart having a moment with Gene Wilder and Peter Ostrum prior to filming a scene in Willy Wonka & the Chocolate Factory in 1971. 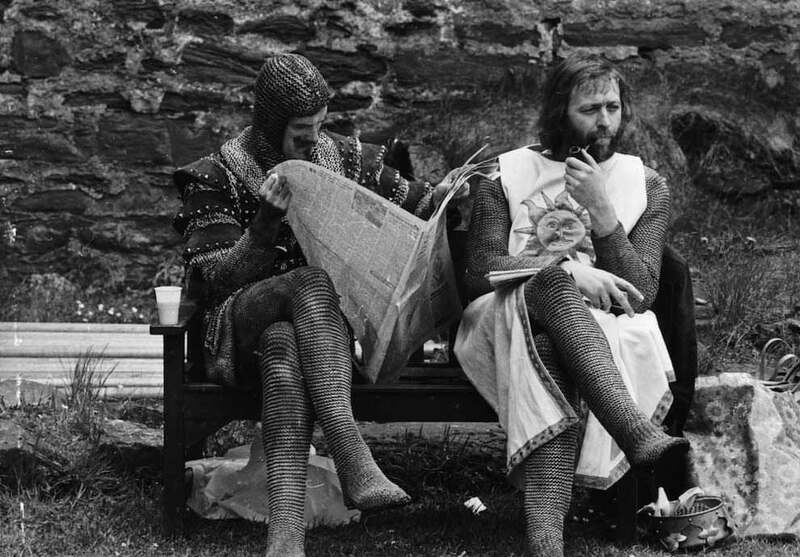 John Cleese and Graham Chapman take a break between filming scenes of Monty Python and the Holy Grail in 1975. 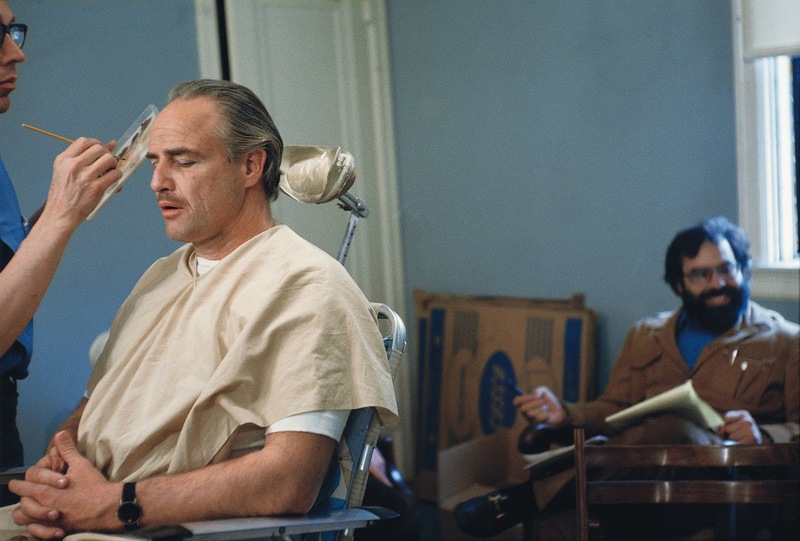 Marlon Brando getting his makeup applied while director Francis Ford Coppola laughs in the background before filming a scene in The Godfather in 1972. Cindy Girling, Kristine DeBell, Bill Murray, Sarah Torgov, Margot Pinvidic and Norma Dell’Agnese on the set of Meatballs in 1979. 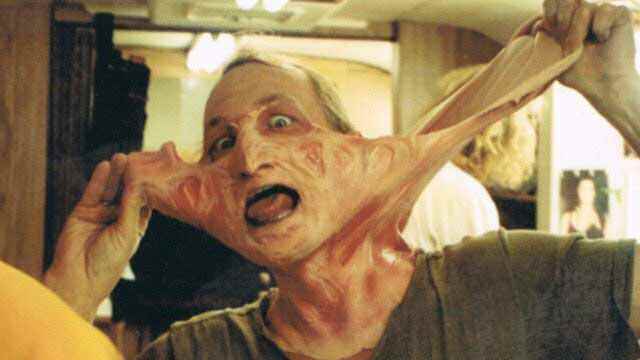 Robert Englund messing around with his prosthetic makeup for A Nightmare on Elm Street in 1984. 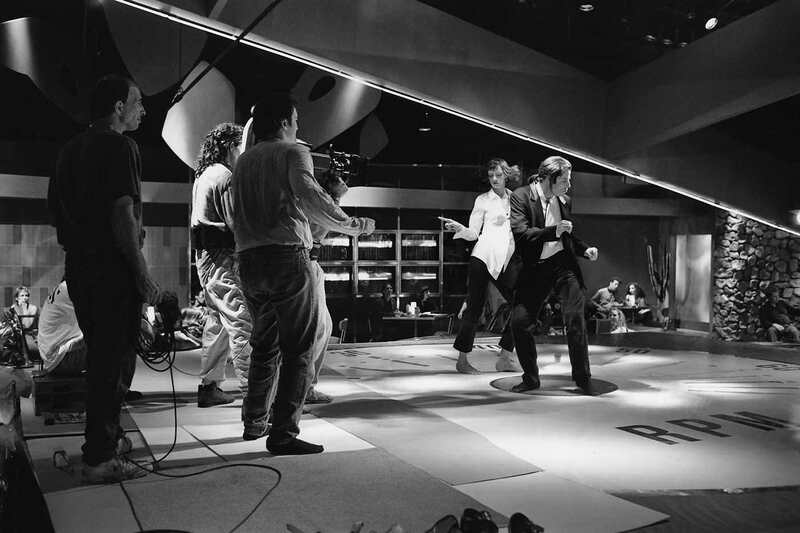 Quinten Tarantino (center) dancing along with John Travolta and Uma Thurman during a scene in Pulp Fiction in 1994. Gemma Arterton has a laugh while Daniel Craig looks on before a scene in Quantum of Solace in 2008. Tony O’Dell, Chad McQueen, Pat Morita, Rob Garrison, Ron Thomas and William Zabka eating ice cream on the set of The Karate Kid in 1984. 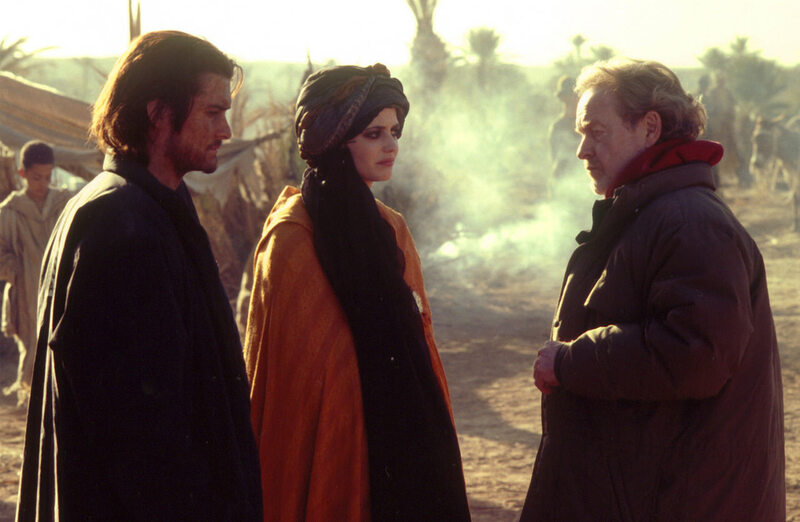 Ridley Scott (right) prepares Orlando Bloom and Eva Green for a scene in Kingdom of Heaven in 2005. Also, if you have never seen the directors cut of this film, go see it. Makes the film from a good film to an absolutely amazing film. Probably the best directors cut I have ever seen. 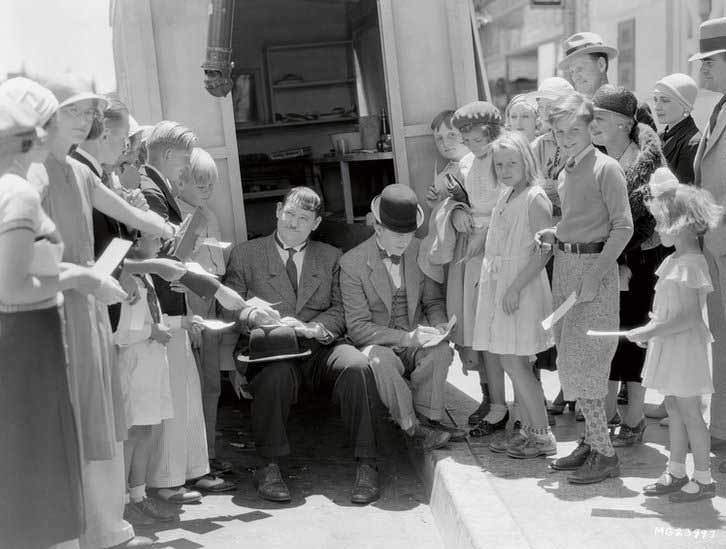 Oliver Hardy and Stan Laurel take a break from filming to sign autographs for some young fans on the set of Pack Up Your Troubles in 1932. 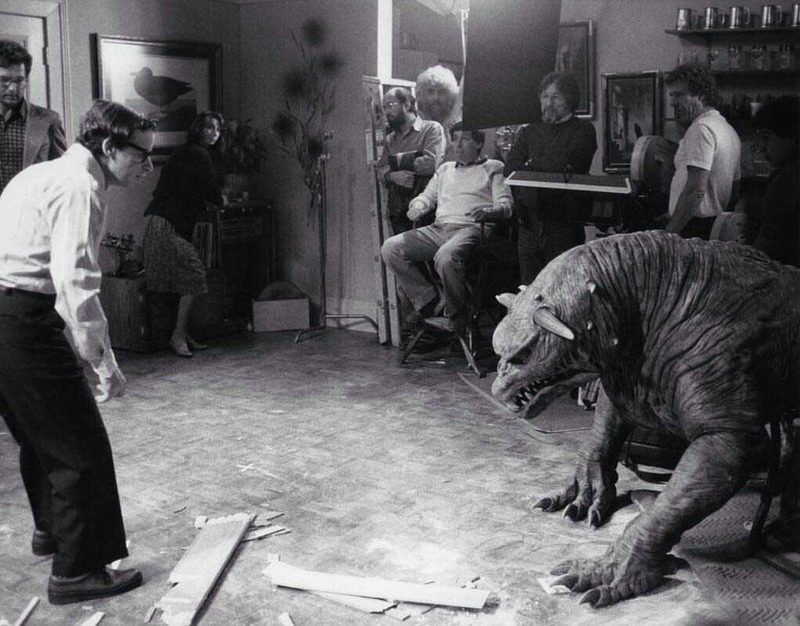 Rick Moranis preparing for his scene in Ghostbusters in 1984. 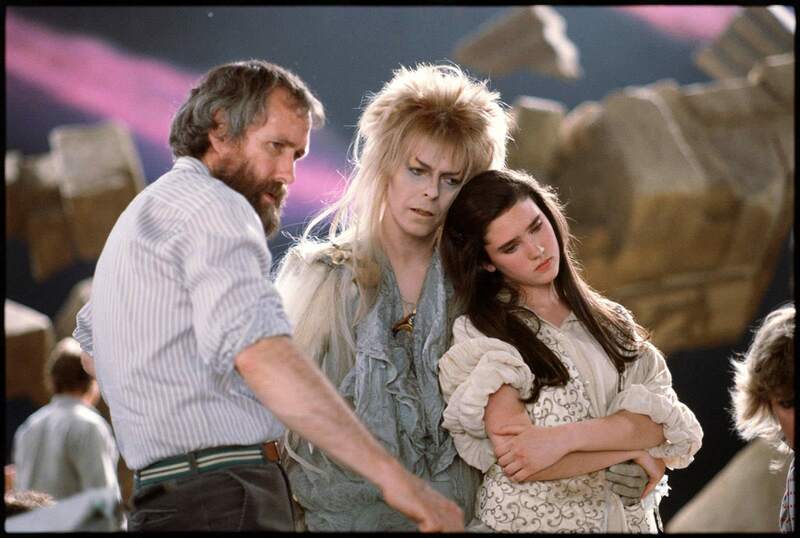 Director Jim Henson showing David Bowie and Jennifer Connelly how he wants them to look for a scene in Labyrinth in 1986. 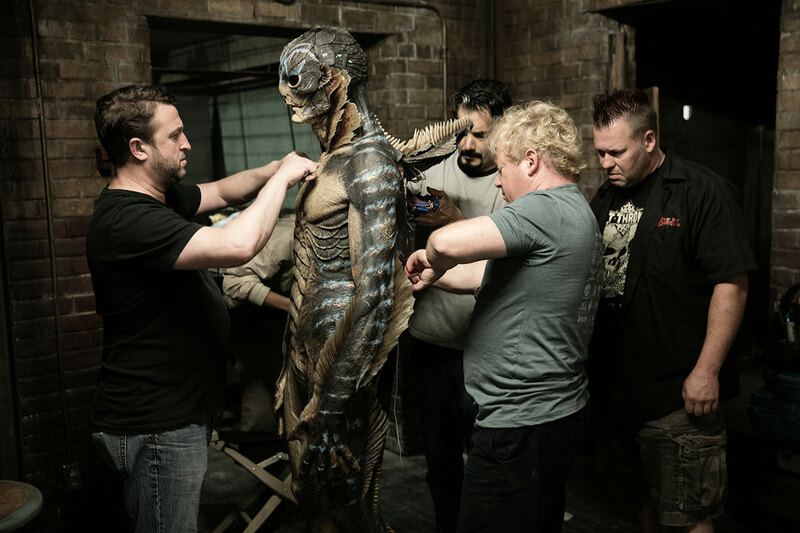 The special effects crew prepare Doug Jones in his costume for a scene in The Shape of Water in 2017. 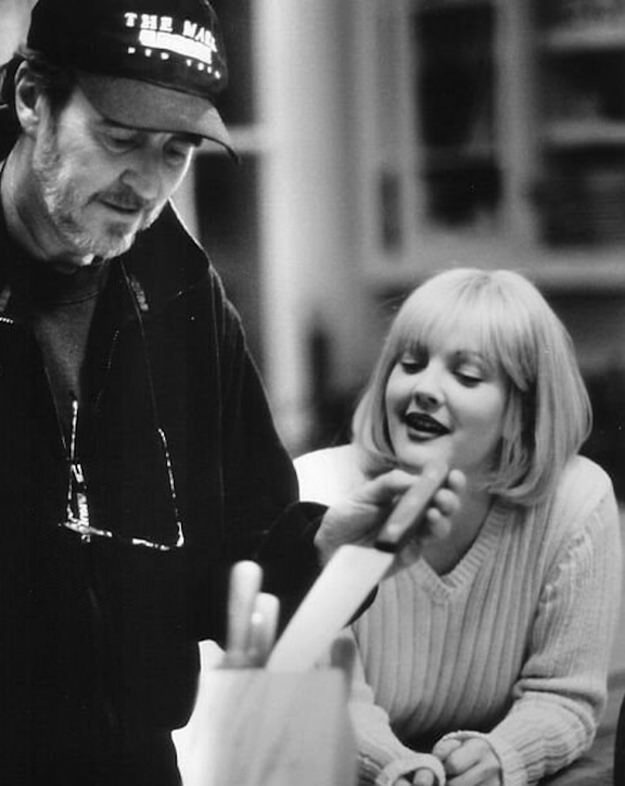 Wes Craven showing Drew Barrymore how he wants her to handle a scene much to her delight for the film Scream in 1996. 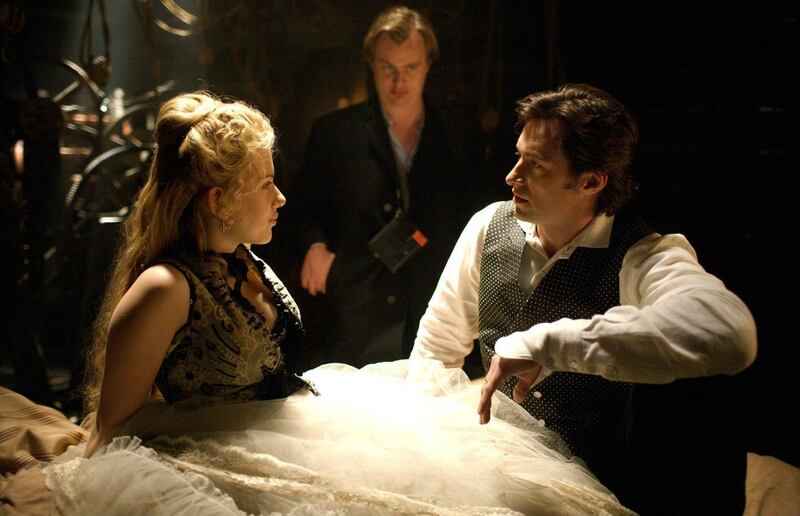 Scarlett Johansson and Hugh Jackman prepare for a scene while director Christopher Nolan looks on for the film The Prestige in 2006. 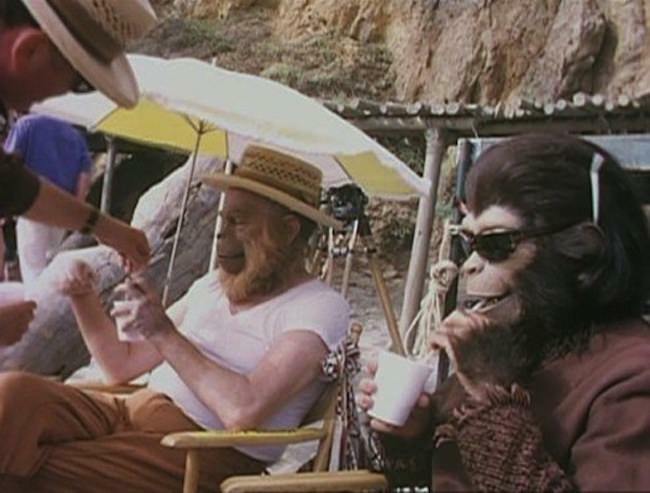 Maurice Evans and Roddy McDowell take a break between scenes of Planet of the Apes in 1968. 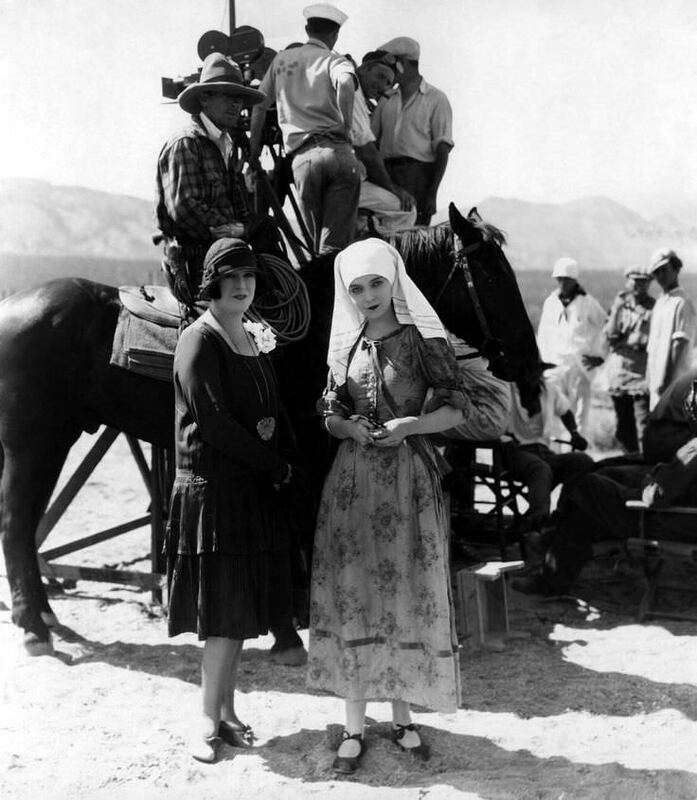 Lillian Gish (front right) poses for a picture with an extra prior to a scene in the film The Wind in 1928. 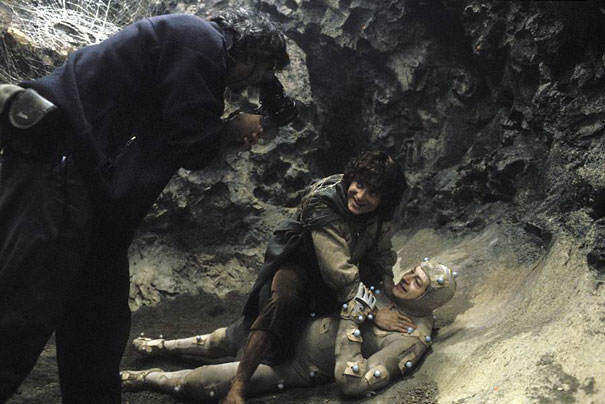 Director Peter Jackson laughs with Elijah Wood and Andy Serkis while filming The Lord of the Rings: The Two Towers in 2002. 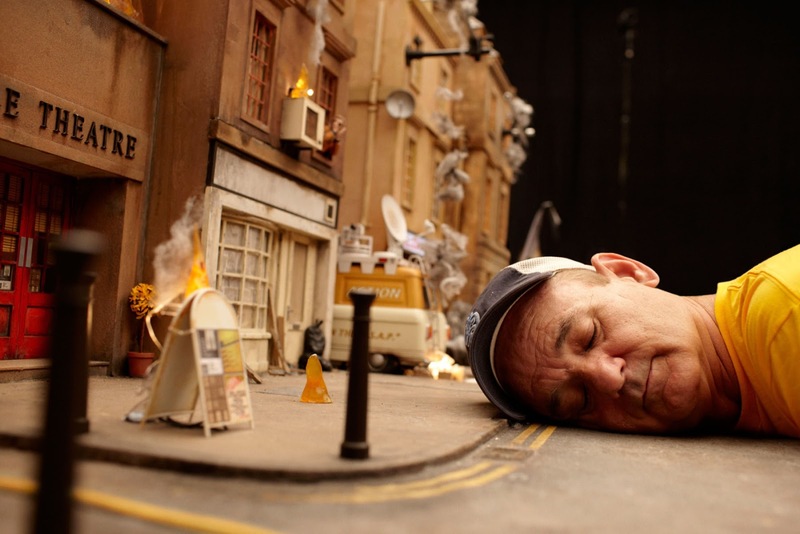 Bill Murray goofing off on the set of Fantastic Mr. Fox in 2009. 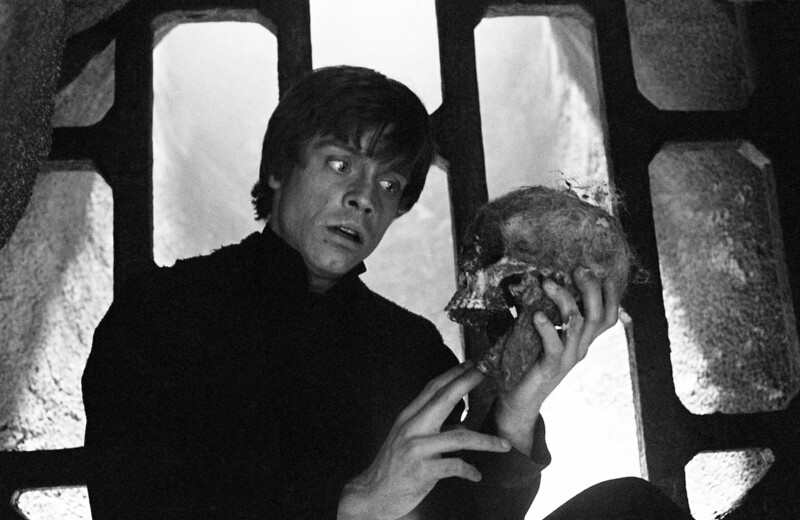 Mark Hamill messing around with a prop prior to a scene in Star Wars VI: The Return of the Jedi in 1983. 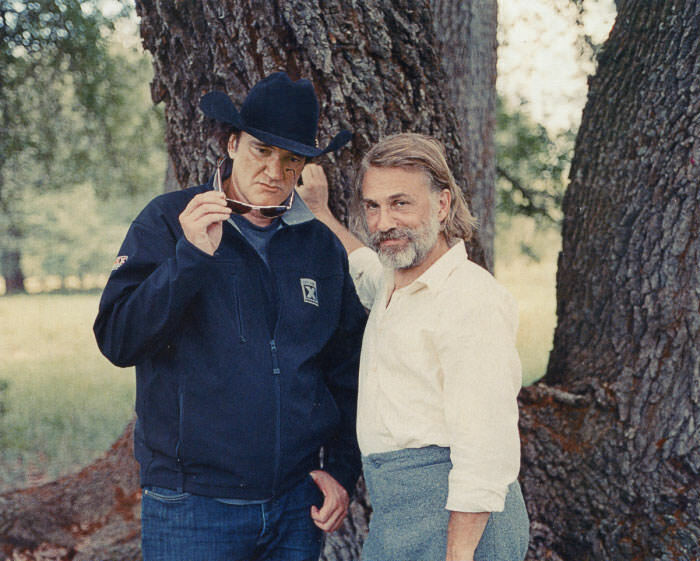 Director Quentin Tarantino and Christoph Waltz pose for a picture prior to a scene in Django Unchained in 2012. 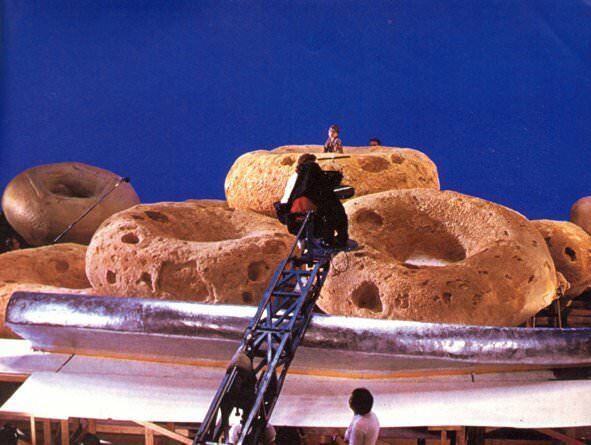 Director Joe Johnston prepares Robert Oliveri for the cereal scene in Honey, I Shrunk the Kids in 1989. 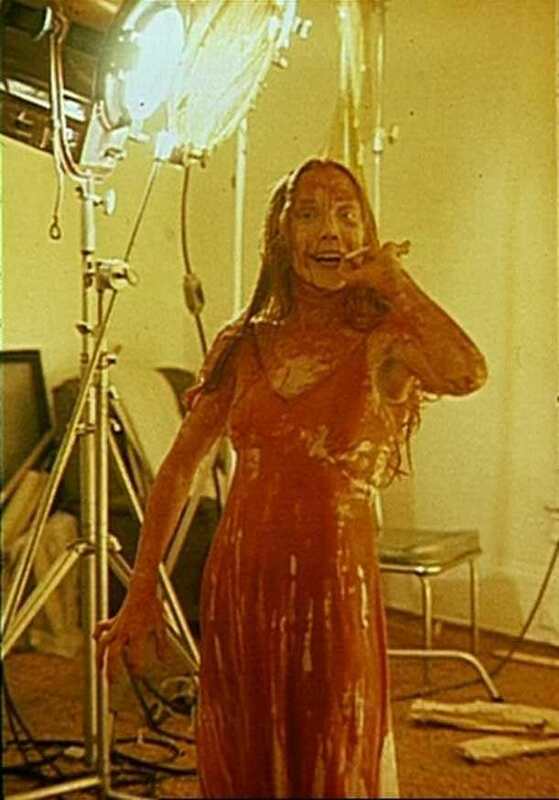 Sissy Spacek smoking a cigarette before her scene in Carrie in 1976. Claudia Cardinale goofing around during filming of The Professionals in 1966. 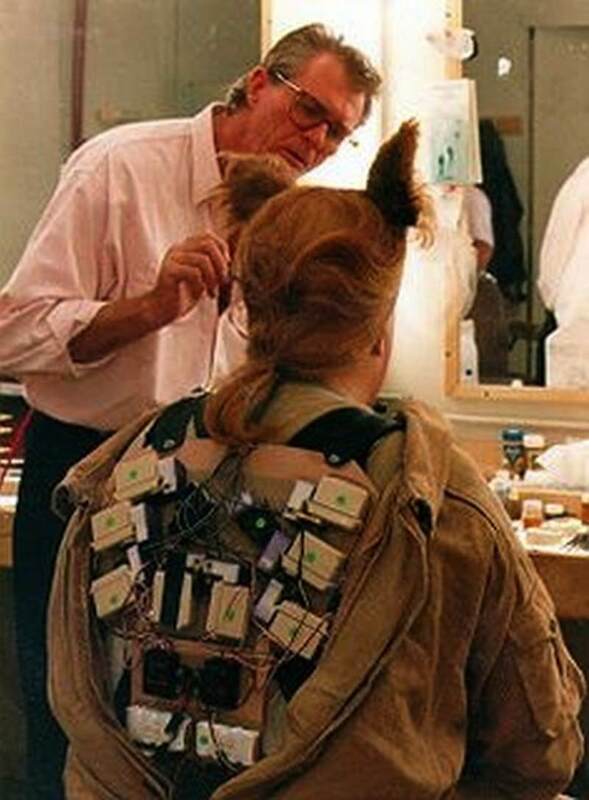 John Candy gets his makeup applied while he shows off the device that controls his tail for the film Spaceballs in 1987. 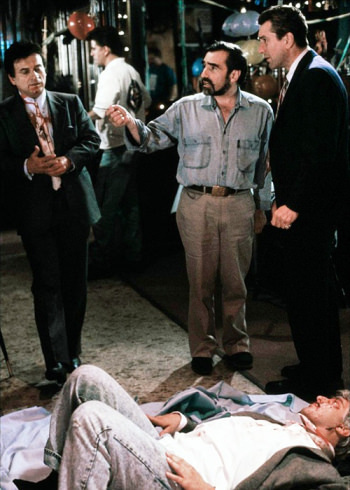 Martin Scorcese (center) directing Joe Pesci, Robert DeNiro and Frank Vincent without the use of a shinebox for the film Goodfellas in 1990. James Remar and Michael Beck take a break while filming The Warriors in 1979. 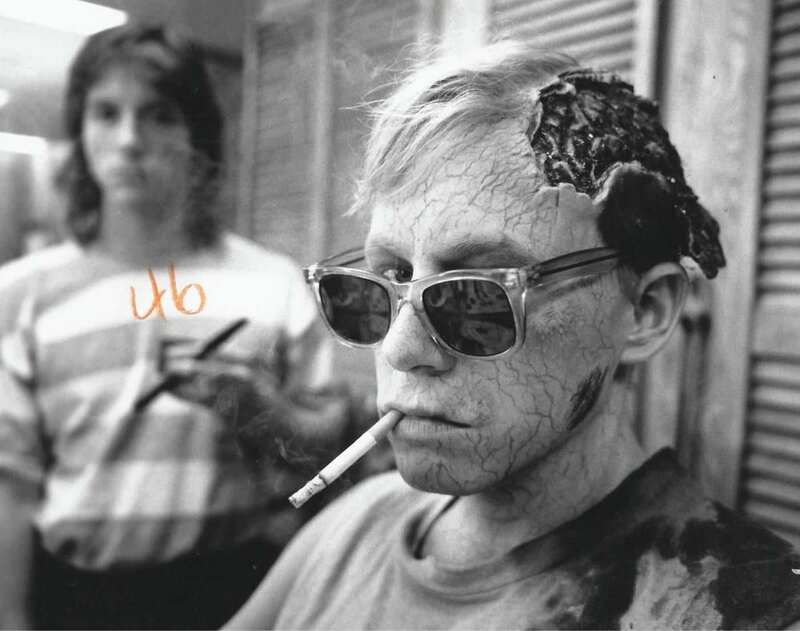 Patricia Arquette takes a break while filming a scene in A Nightmare on Elm Street 3: Dream Warriors in 1987. Johnny Depp contemplating what happened to the rum while Keira Knightley prepares for her scene in Pirates of the Caribbean: The Curse of the Black Pearl in 2003. 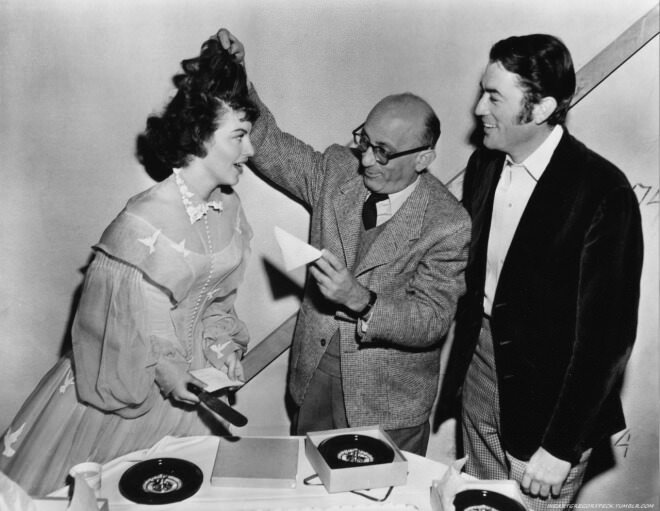 Director Robert Siodmak messing around with Ava Gardners hair while Gregory Peck laughs before a scene in The Great Sinner in 1949. 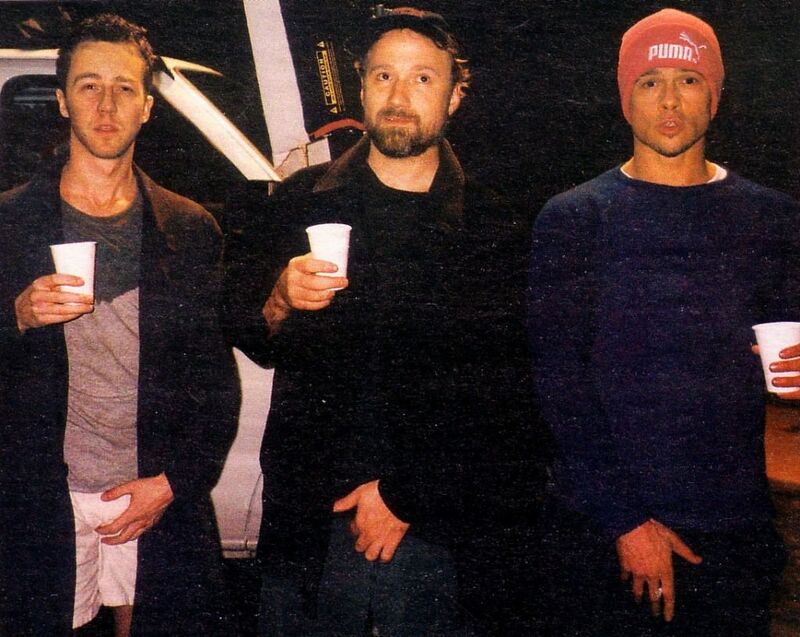 Edward Norton, David Fincher, and Brad Pitt hold it together between scenes of Fight Club in 1999. 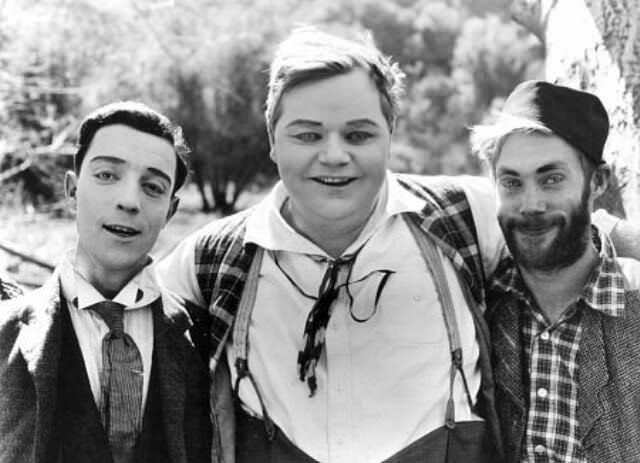 Buster Keaton, Fatty Arbuckle, and Al St. John pose for a picture while filming Keatons first film credit The Butcher Boy in 1917. 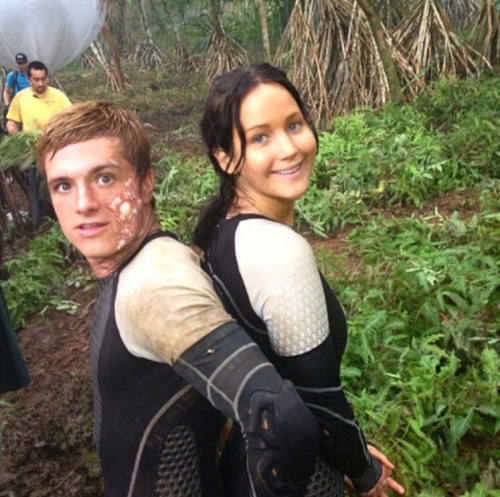 Josh Hutcherson and Jennifer Lawrence have a laugh between scenes of The Hunger Games: Catching Fire in 2013. 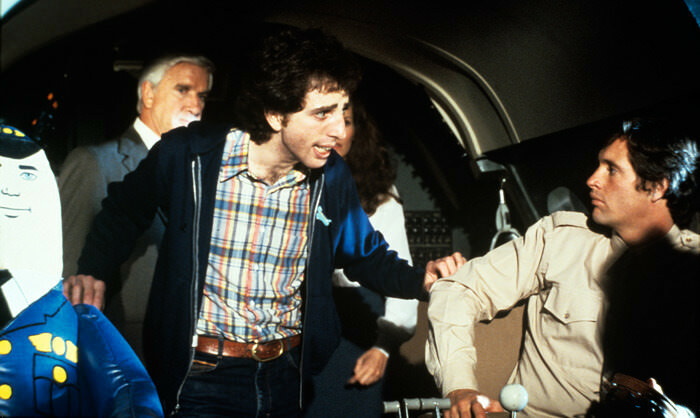 Director David Zucker (center) tells Robert Hays how he wants him in the next scene while Leslie Neilsen and Julie Hagerty look on during filming of Airplane! in 1980. Sigourney Weaver getting in the space gear used for a scene in Alien in 1979. 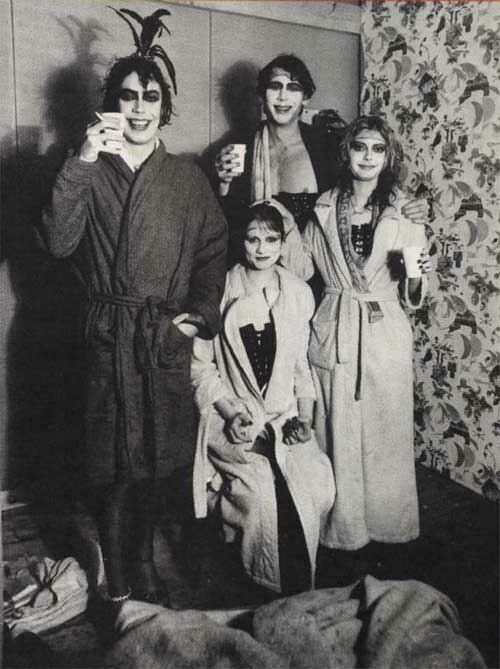 Tim Curry, Nell Campbell, Barry Bostwick and Susan Sarandon take a break between scenes of The Rocky Horror Picture Show in 1975. 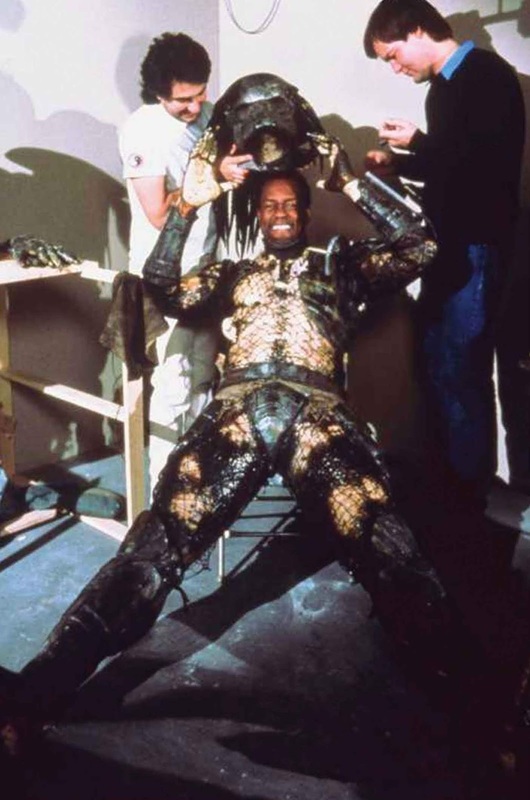 Kevin Peter Hall taking off his costume on the set of Predator in 1987. 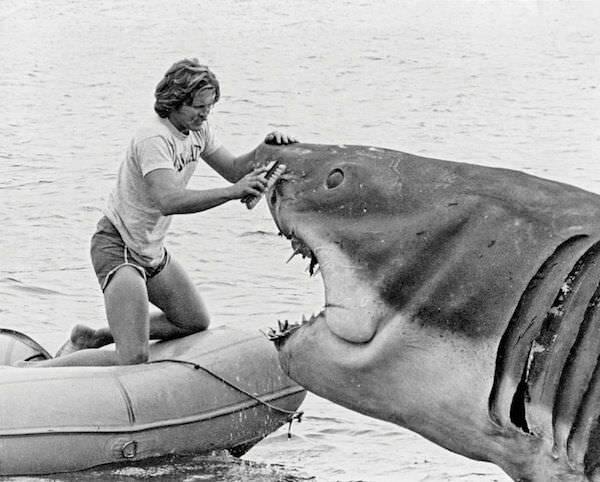 A special effects employee cleans the face of the shark in the film Jaws in 1975. 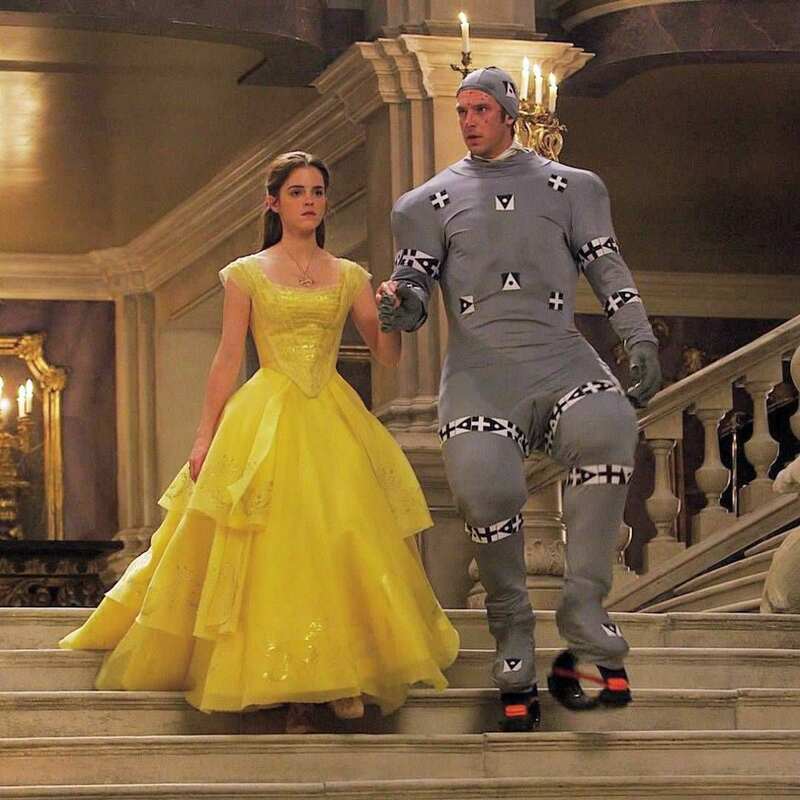 Emma Watson and Dan Stevens during a scene in Beauty and the Beast in 2017. 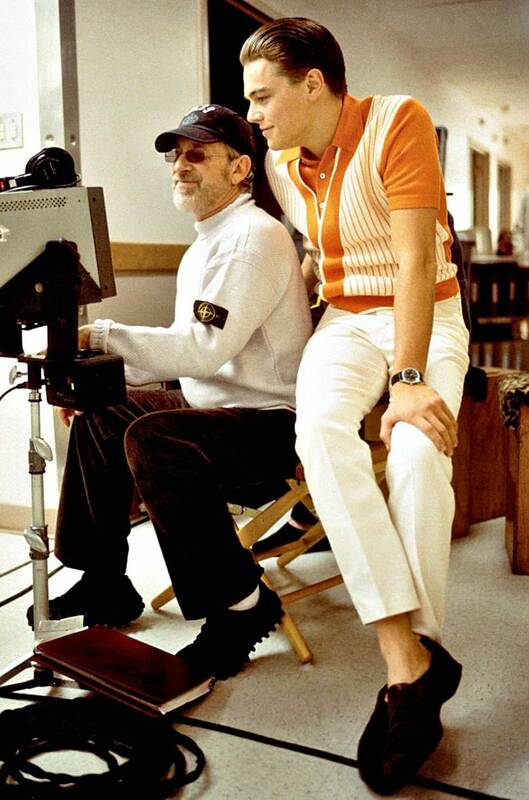 Steven Spielberg and Leonardo DiCaprio on the set of Catch Me If You Can in 2002. 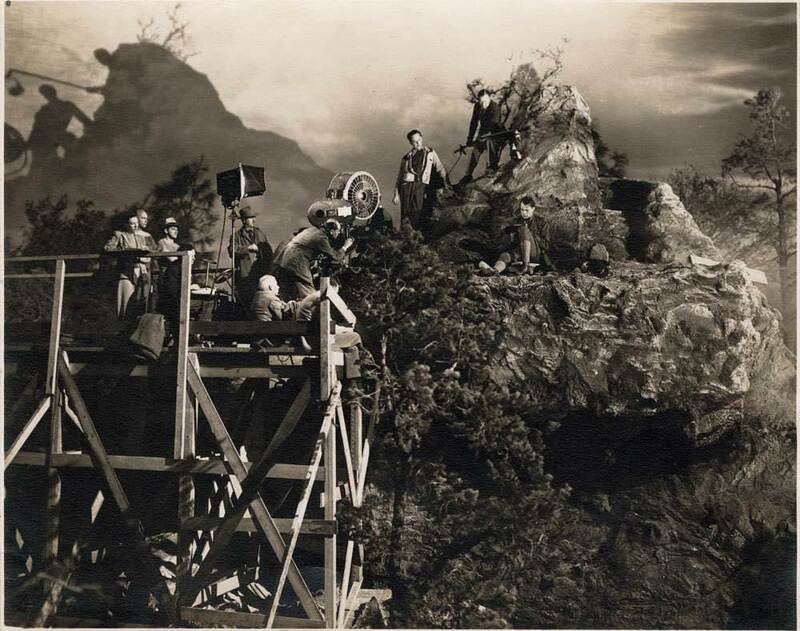 Crew members preparing to shoot a scene with Gary Cooper (sitting) for the film Sergeant York in 1941. 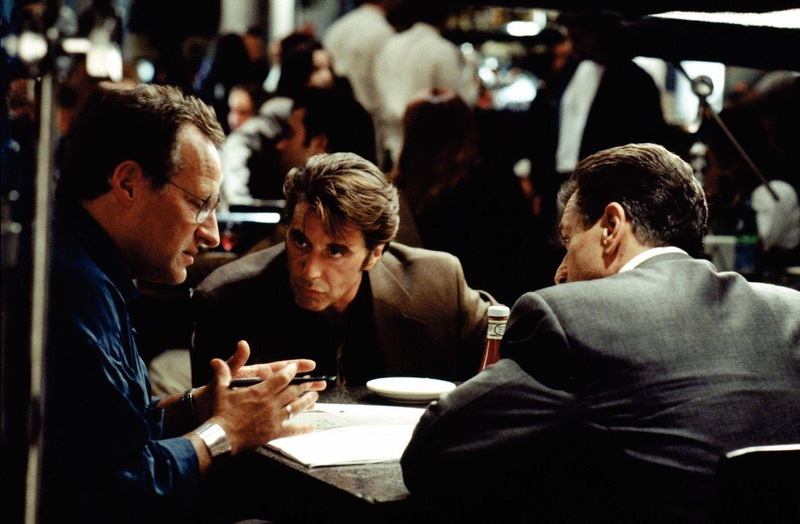 Director Michael Mann talking about the upcoming scene with Al Pacino and Robert DeNiro for the film Heat in 1995. Catherine Zeta Jones getting makeup applied for a scene in Chicago in 2002. 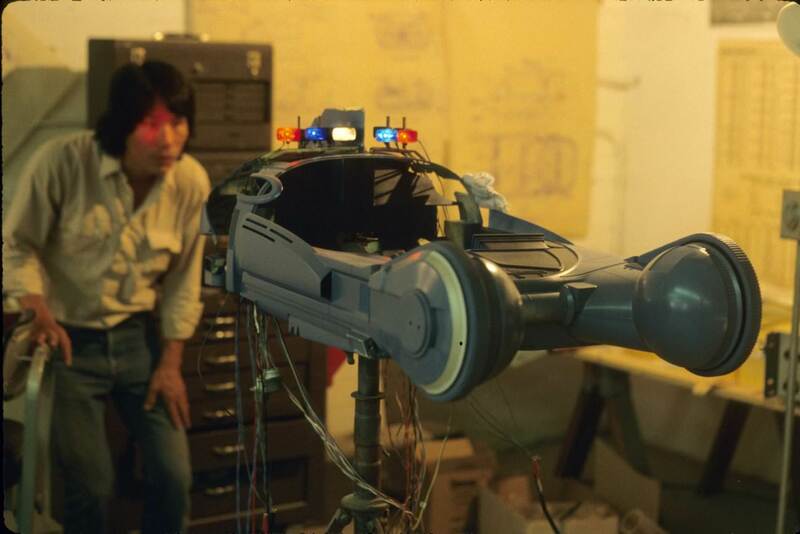 A special effects crew member working on the car for the film Blade Runner in 1982. 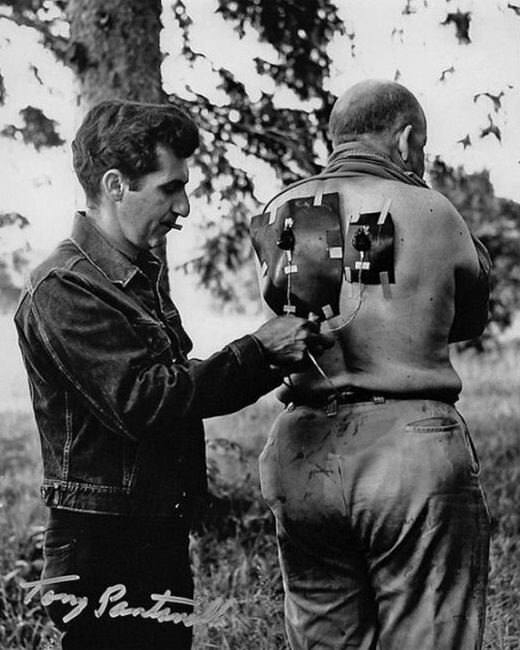 Brad Greenquist taking a cigarette break while filming Pet Sematary in 1989. 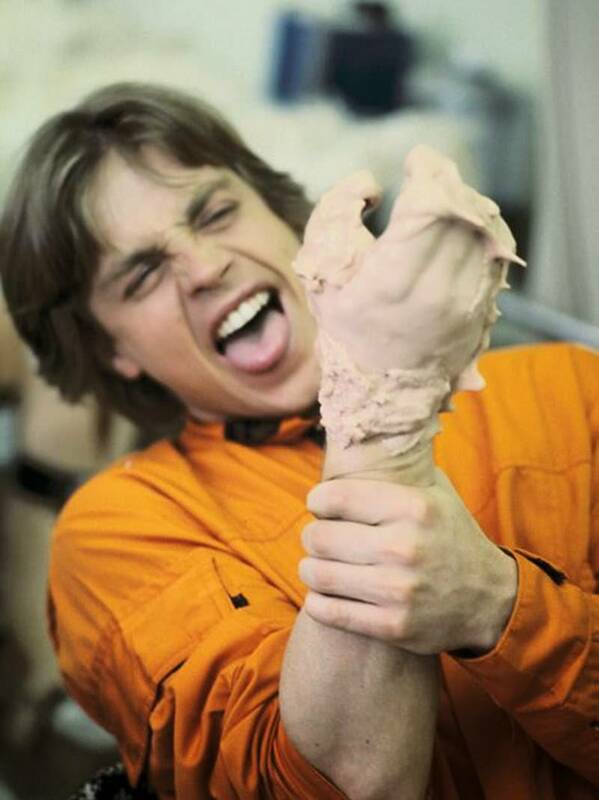 Mark Hamill practicing for the scene where he loses his hand for the film Star Wars: The Empire Strikes Back in 1980. 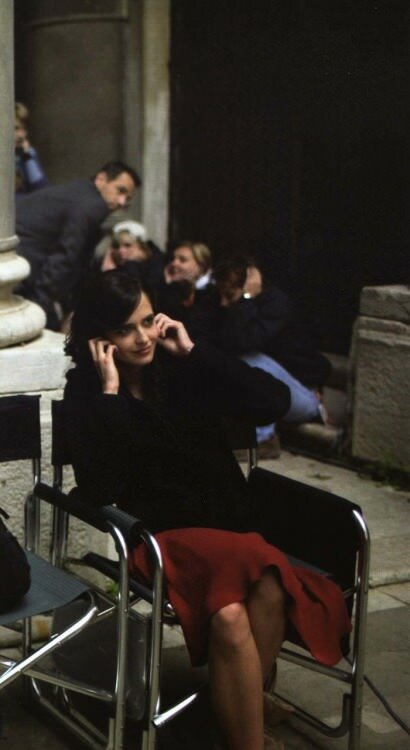 Eva Green and other members of the crew cover their ears before a blast during an action scene in Casino Royale in 2006. 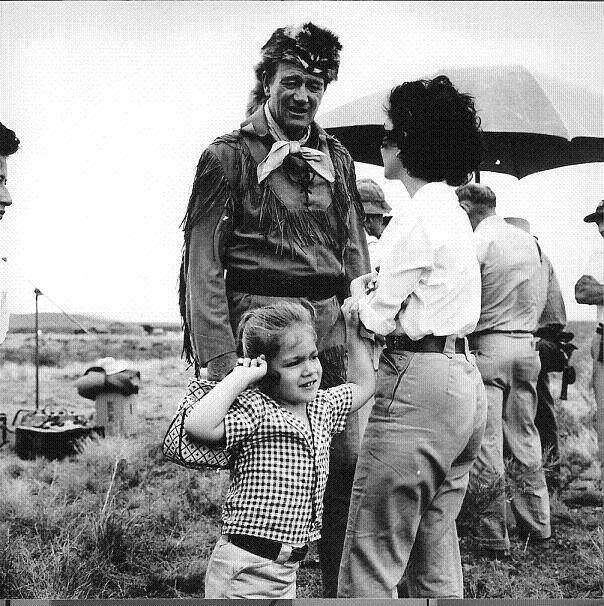 John Wayne takes a break to talk with his wife Pilar Wayne and his daughter Aisse Wayne while filming The Alamo in 1960. 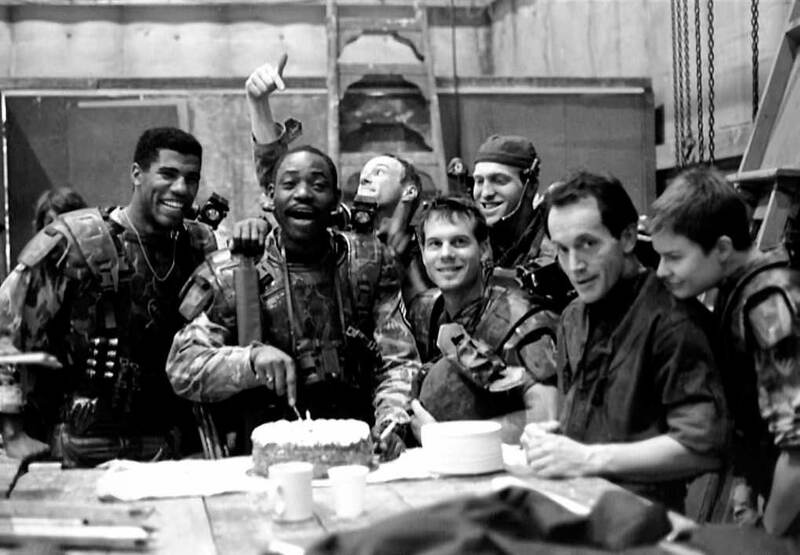 Interesting note, this films budget went over badly and Wayne paid for all the extra filming and overtime pay to the cast and crew himself. The special effects crew working a fake dinosaur while Bryce Dallas Howard and Chris Pratt rehearse a scene for the film Jurassic World in 2015. 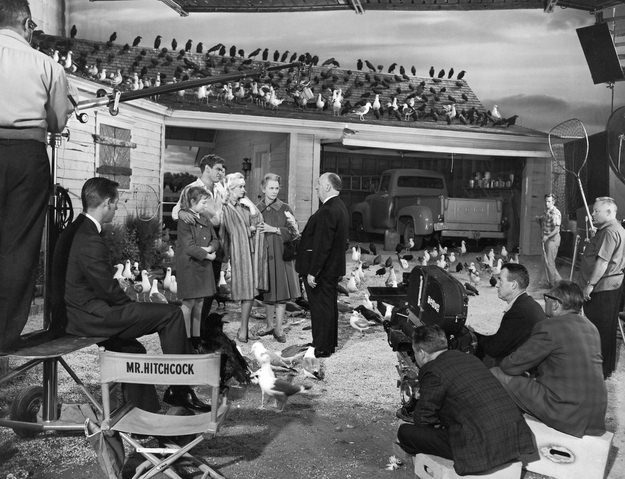 Alfred Hitchcock (center black suit) prepares everyone for a scene in The Birds in 1963. Director Sam Mendes prepares to shoot the iconic rose petals dream scene with Mena Suvari for the film American Beauty in 1999. 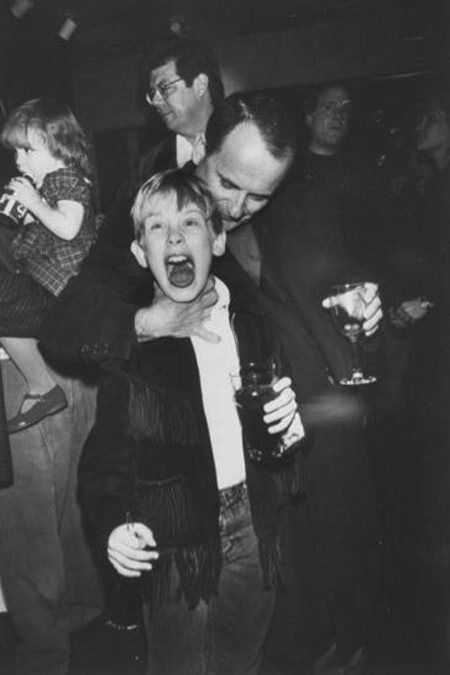 Joe Pesci messing around with Macaulay Culkin at an after party for the film Home Alone in 1990.